Mecum Auctions knows how to identify opportunity. 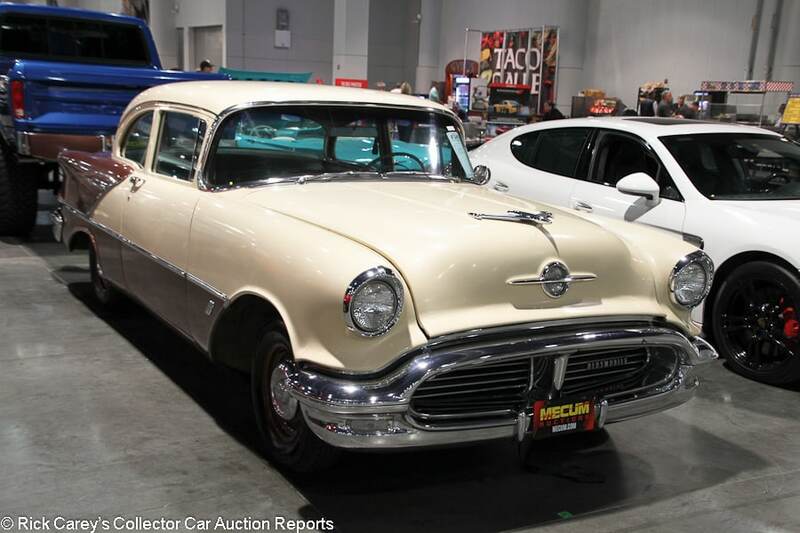 Mecum rolled into Las Vegas for the first time with a three-day sale November 16-18 at the Las Vegas Convention Center. 887 vehicles were offered, 553 of them sold, a 62.3% sale rate, bringing a total of $22,204,275. That was an average transaction of $40,152 and a median of $27,500, a median/mean ratio of 68.5%. 130 of the 887 vehicles on offer were no reserve, 14.7%. 333 lots crossed Mecum’s block on Friday, 349 on Saturday. 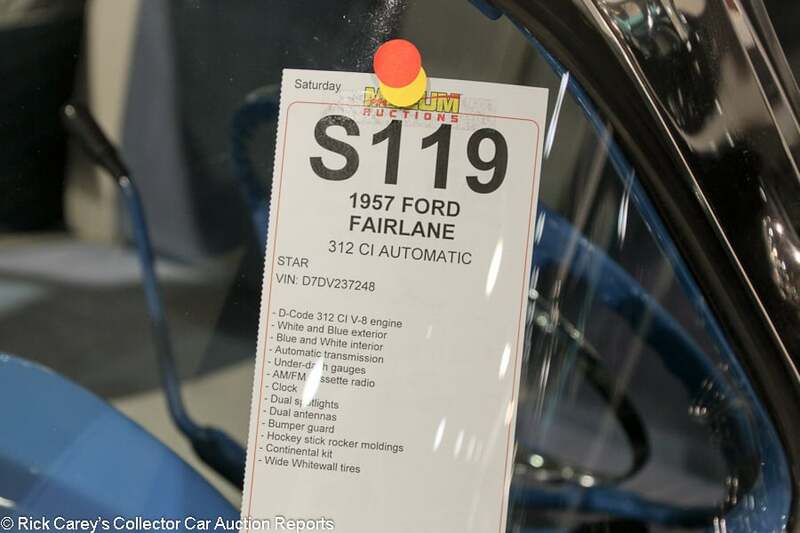 17-18 lots/hour, about 3 ½ minutes per lot, is usual in collector car auctions while ringmen wring bids out of the multitude and the grinder works consignors to lift the reserve. Mecum does almost 30/hour: two minutes on the block. Bidders act or they are dismissed; consignors take the money (if there is any) or are condemned to a late night and usually unsuccessful re-run in the wee hours of the next day’s sale. 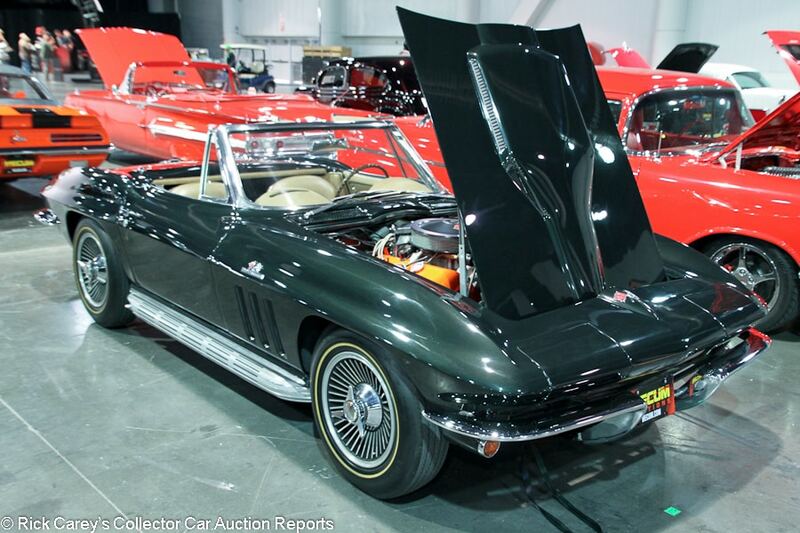 Mecum Auctions is a carefully calibrated and managed system, and it works. The action is non-stop and both consignors and bidders are compelled by its incessant process to pay attention. An indecisive bidder or consignor unwilling (or unable) to make a decision who protracts a lot on the block to four, five or more minutes while the auctioneer repeats “37,500 … 37,500 … duh-duh-duh” is the kiss of death for an auction’s flow. Mecum doesn’t tolerate that, to their credit. 288 of the vehicles consigned, 32.5%, had prior auction history, often at other Mecum auctions: Don’t find the right audience here, try there a few weeks or months later. Some examples will be found in the reports that follow. B-J is a completely different system. Both of them work. But for bidders and consignors, choosing the system and the process that works for them is crucial. 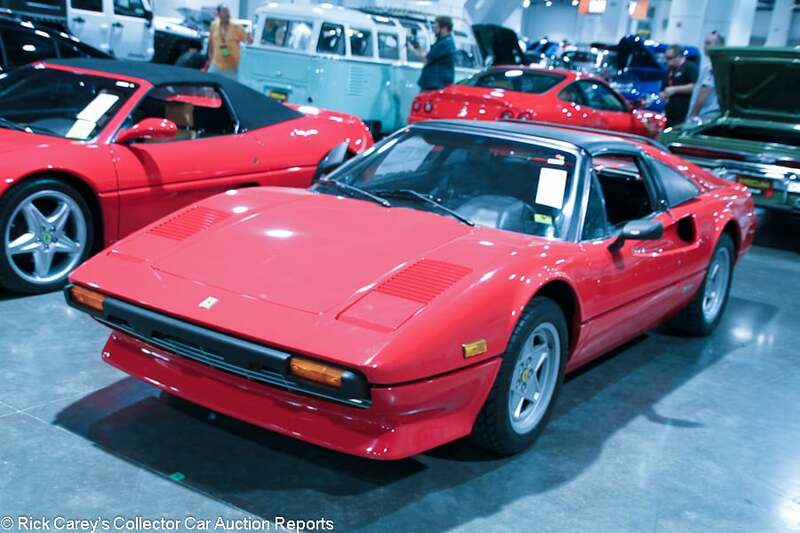 In common with recent auction reports there’s little movement evident in transaction values, a reflection of a collector car market that’s at best static. Asked recently what’s the best buy the prudent advice is, “Buy what you like, enjoy it and forget about speculative profits. If you want to speculate, buy bitcoin.” Fortunately for car collectors, that seems to be where the hot money is going. The reports that follow were compiled on site by Andrew Newton. Andrew contributed many of the transaction comments (particularly on late model Porches, which are a cypher to me), but as always the final content is my responsibility. Descriptions are sorted by marque, model, body style and year for easier searching. 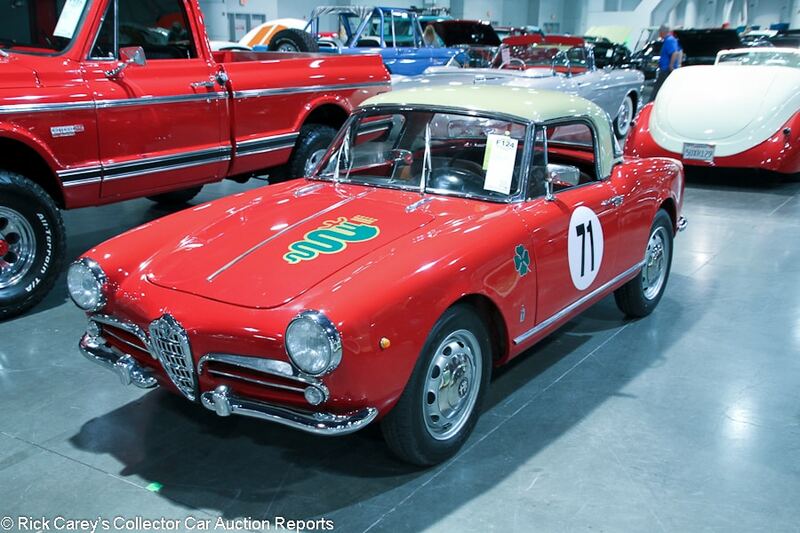 Lot # F124 1959 Alfa Romeo Giulietta Spider; S/N AR149506727; Red, Tan hardtop/Brown leather; Enthusiast restoration, 3+ condition; Hammered Sold at $38,000 plus commission of 10.00%; Final Price $41,800. With Reserve. – Single Weber, hub caps, Firestone tires, hardtop, Personal steering wheel. – Represented as restored last year but no other history. Some paint cracks around the hood, and the red paint on the hood doesn’t match the rest of the body. The brightwork is a bit tired. The rear window gasket on the hardtop is loose and dry. Good, lightly worn interior. Lightly worn underneath but the exhaust looks newer. All the money on this car appears to have been spent under the hood, where the engine looks new and spotless. An attractive but flawed driver. – Unsold on the block with a reported bid of $45,000 but reported by Mecum sold later for this much more sensible amount for a superficially restored driver quality Normale Spider with a strange color hardtop. 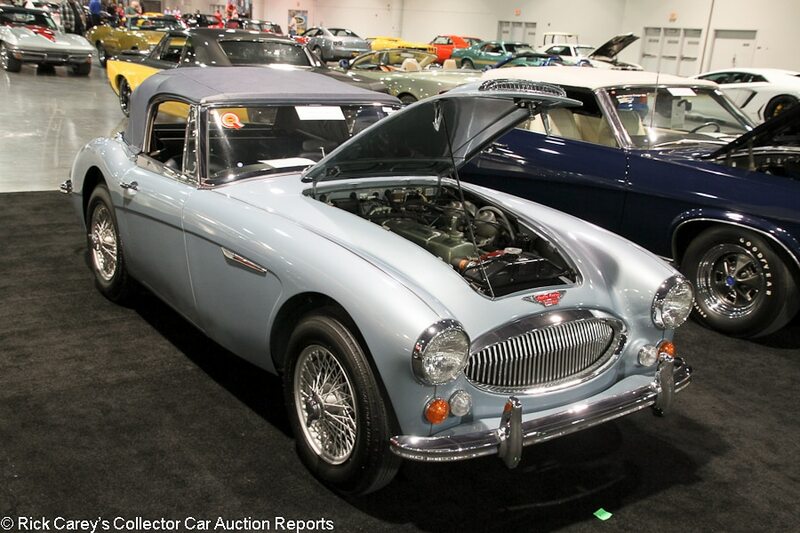 Lot # S85.1 1967 Austin-Healey 3000 Mk III Phase 2 Convertible; S/N HBJ8L39179; Light Blue/Dark Blue vinyl; Dark Blue vinyl top; Older restoration, 2 condition; Not sold at Hammer bid of $70,000 $70,000. With Reserve. – Painted centerlock wire wheels, Dunlop tires, banjo steering wheel, overdrive, heater. – From the Kevin Collins collection. The passenger’s door sticks out at the bottom. Spotless engine bay. Excellent paint and chrome. Very good tight-fitting top. Very good interior. Fully restored, mostly excellent final year Big Healey. – Not sold at Mecum Kissimmee in 2013 at a $115,000 high bid, then not sold again there the next year at a $97,000 high bid, then one more time at Mecum Austin in 2014 at an $85,000 high bid. Interest in Big Healeys has fallen off, at least at the high price points, as this car’s auction history clearly shows. The seller is chasing the market down. 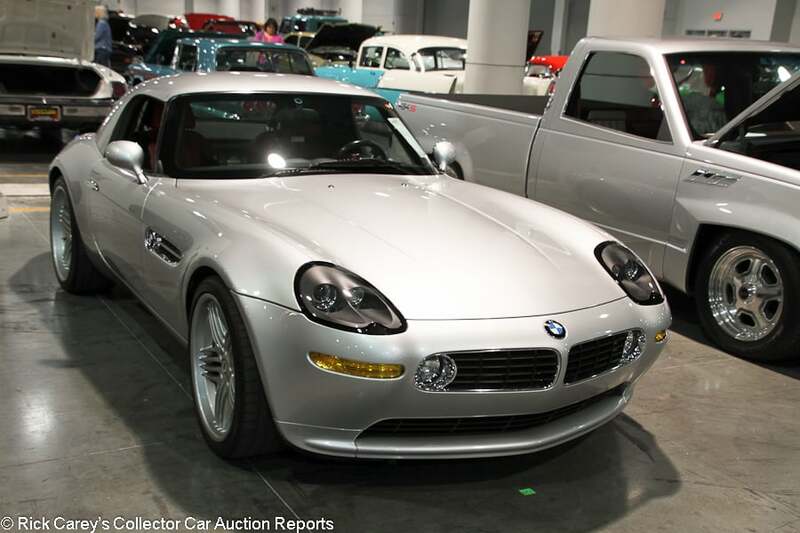 Lot # F67.1 2003 BMW Z8 Alpina Roadster; S/N WBAEJ13423AH62395; Silver, Silver Hardtop/Black, Red leather; Unrestored original, 2- condition; Not sold at Hammer bid of $150,000. With Reserve. – Michelin tires, Alpina wheels, power everything. – One of 555 built. Showing 37,750 miles, which is higher mileage than most. A handful of small chips on the nose and some light but noticeable wear to the driver’s seat. Not like new as most of these cars are, but close enough. – Several Z8 Alpinas have sold for higher than this reported high bid at auction this year, but all have been better cars with lower mileage and the reported high bid here seems like it should have been enough. 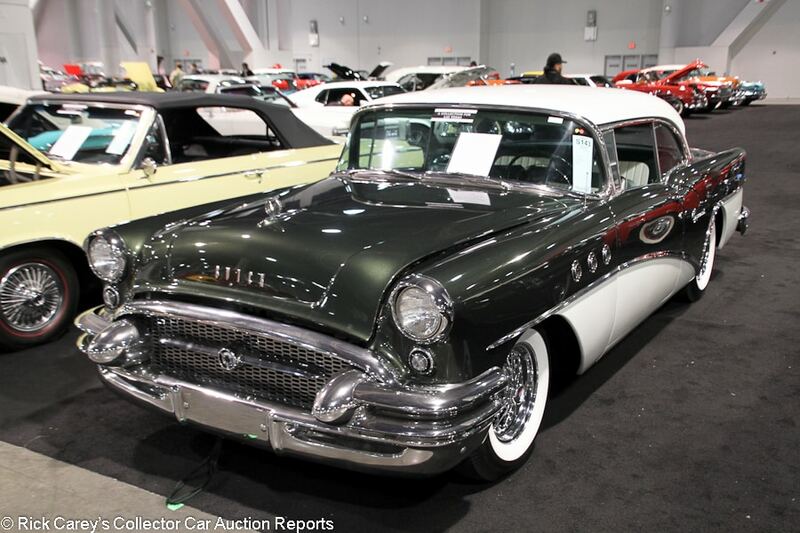 Lot # S143 1955 Buick Special Tourback Sedan; S/N 4B2039710; Belfast Green, Dover White/Green, White; Older restoration, 2- condition; Not sold at Hammer bid of $23,000. With Reserve. – 322/188hp, Dynaflow, wire wheels, whitewalls, aftermarket stereo, dash clock. – The finish of the paint is very good, but there are several scrapes around the edges of the hood due to poor alignment and a big chip in the right front fender. Mostly good chrome and brightwork, but the rear bumper looks original and tired. Very good, mostly restored interior but the original gauges and switchgear are a bit tired. Tidy and restored underneath. A mostly attractive car, but a few corners were cut. – Sold for $36,300 at Barrett-Jackson Las Vegas in 2012 when it probably had more pop. Now its aged and neglected and this bid is what the consignor should accept as the current value. This is the base, basic, decontented Buick Special, with nothing special about it. 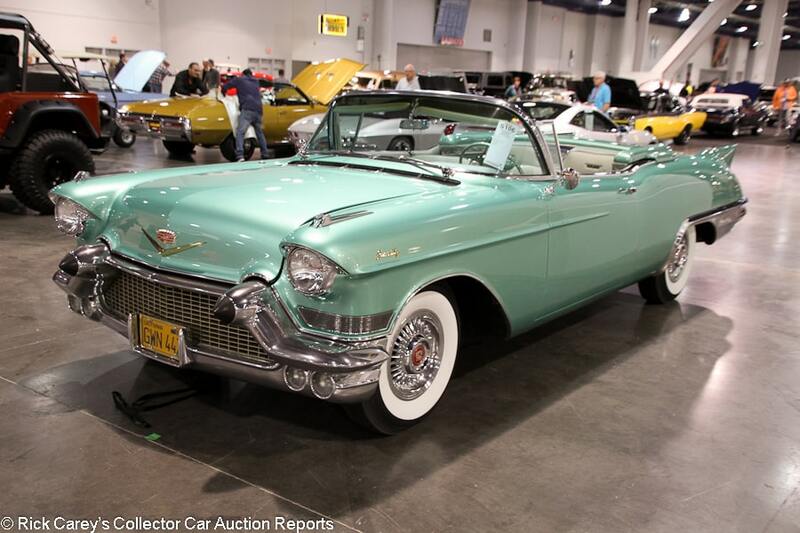 Lot # S106 1957 Cadillac Eldorado Biarritz Convertible; S/N 5762060266; Jamaican Green/Green leather; Older restoration, 2- condition; Hammered Sold at $148,000 plus commission of 10.00%; Final Price $162,800. With Reserve. – Wheel covers, whitewalls, gold brightwork, parade boot, pushbutton radio, dash clock, rear seat speaker, power windows, power top, dual quads, power seat, Autronic Eye. – Fairly dull original front bumper, but the rear bumper has been rechromed. Excellent paint other than two scratches near the radio antenna. Even gaps. Very light wrinkling to the seats and very light pitting on the metal parts of the dash. Body-off restored in 2012, this car has a lot going for it but enough corners were cut that it really isn’t ready for a show field. – Unsold on the block at a bid of $135,000, closed later with this result appropriate to its magnificence and superficial restoration. Driving around on a bright summer Saturday evening, though, no one will pick apart the restoration while exulting in its flamboyant excess. 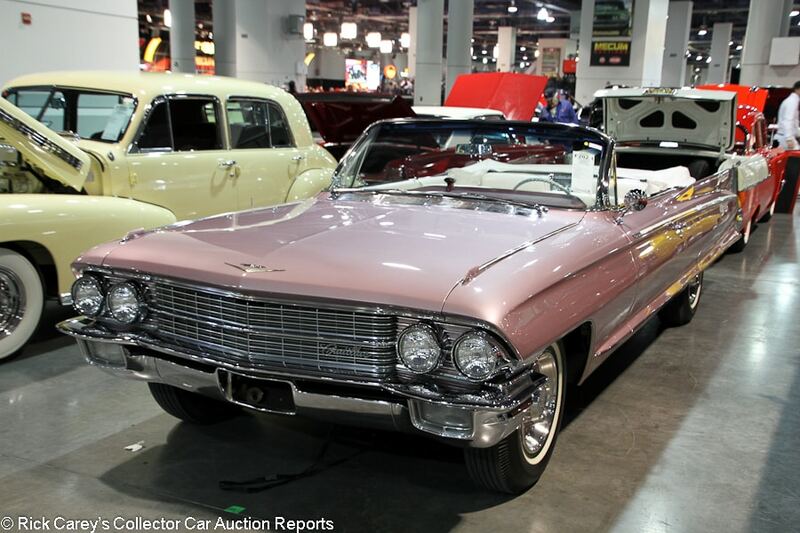 Lot # F202.1 1962 Cadillac Eldorado Biarritz Convertible; S/N 62E064257; Light Rose/White leather; Older restoration, 3+ condition; Not sold at Hammer bid of $50,000. With Reserve. – Wheel covers, narrow whitewalls, boot cover, bucket seats, factory air conditioning, power top, power windows, WonderBar radio, rear seat speaker, dash clock. – Tidy and restored but lightly used engine bay and underbody. Erratic panel fit, but it’s not bad. Very good paint apart from a large chip on the right front fender and another one on the passenger’s door. Mostly good interior, but the seats are quite worn, even cracking in places both front and back. A lightly used older restoration. – The fact that this Eldorado Biarritz convertible was bid to only $1,000 more than the ’59 Fleetwood 60 Special sold just before it speaks volumes about its condition. For one there was confidence, for this one there was apprehension. 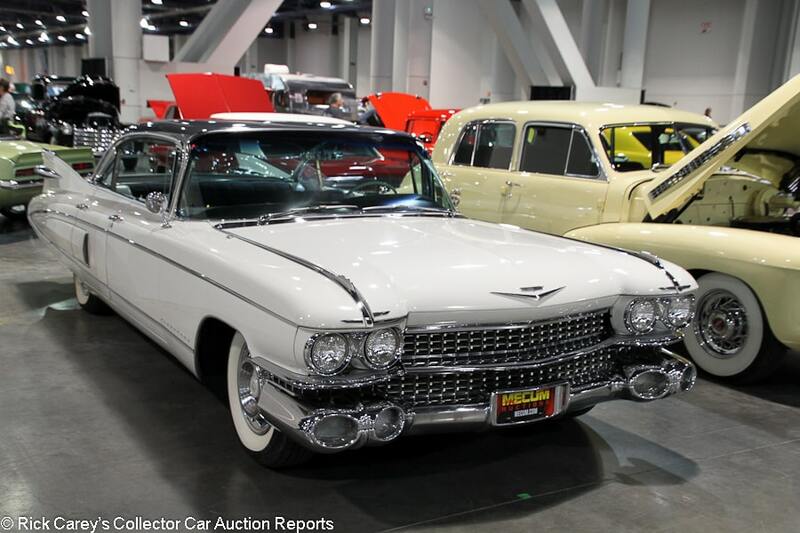 Lot # F201.1 1959 Cadillac Fleetwood 60 Special 4-Dr. Hardtop; S/N 59M125907; White, Gray roof/White leather, Black cloth; Visually maintained, largely original, 3+ condition; Hammered Sold at $49,000 plus commission of 10.00%; Final Price $53,900. With Reserve. – Wheel covers, whitewalls, dual mirrors, fender skirts, dash clock, factory radio, power windows, power steering, power brakes. – Owned by a Cadillac mechanic from 1966-2012. Very good older paint. The original chrome and brightwork is quite good as well. Tidy original engine bay and underbody. Light scuffs on the whitewalls. The seats are fairly worn and there is light cracking in the leather, but the original interior is mostly quite good. An attractive car in most every way and arguably too good to restore. – Not quite a Preservation Class Cadillac but close, the bidders paid a 2 condition money for a 3+ condition car based upon its comforting history, preservation and quality. The result is surprising. 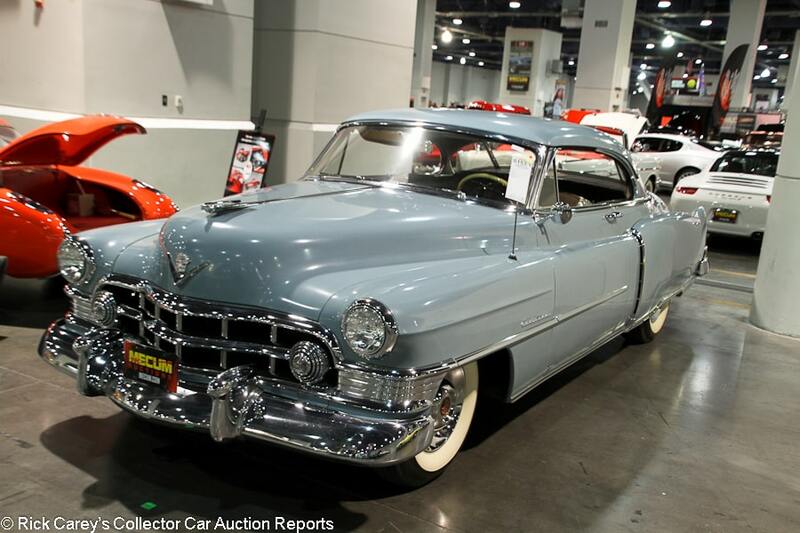 Lot # S153.1 1950 Cadillac Series 62 Club Coupe; S/N 506291493; Light Blue/Gray cloth; Unrestored original, 2- condition; Not sold at Hammer bid of $40,000. With Reserve. – Automatic, wheel covers, whitewalls, hood ornament, dash clock, factory radio, fender skirts. – A time warp car with original paint, chrome and interior. Everything is a bit on the dull side but there are no major blemishes. Even the cloth upholstery is in fantastic shape. WAY too good to restore. It’s in remarkable shape, even for a Western car. – For all its wonderful preservation this is still a Club Coupe and the 25% premium represented by the reported high bid is an appropriate originality premium. It could have been sold with only limited regret. 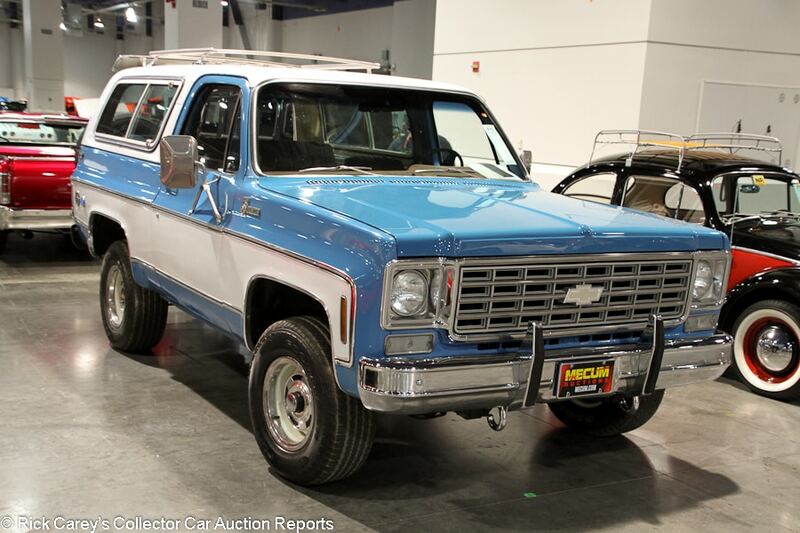 Lot # F133.1 1972 Chevrolet C10 Suburban Custom Deluxe Utility Vehicle; S/N CKE162F106776; Light Blue, White roof/Blue vinyl; Recent restoration, 2 condition; Hammered Sold at $31,000 plus commission of 10.00%; Final Price $34,100. No Reserve. – 350/175hp, automatic, All Terrain T/A tires, power steering, power brakes, three-row seating, bench seat, floor shift. – Very clean engine bay. A few light scratches on the grille and a small but deep scratch behind the right headlight. Otherwise very good paint and chrome. The door fit is a little erratic. The interior is excellent. A very well restored three-door Suburban done to slightly better than truck standards. – Yet another example of vintage GM trucks being particularly hot at the moment. We may not see these Suburbans at auction as much as C10s and Blazers, but if this price is a guide they are apparently just as desirable. Lot # S73 1968 Chevrolet Camaro Yenko 2-Dr. Hardtop; S/N 124378N413263; Fathom Blue, White/Black vinyl; Older restoration, 2 condition; Hammered Sold at $600,000 plus commission of 10.00%; Final Price $660,000. With Reserve. – 427/450hp, 4-speed, Rally wheels, Firestone red line tires, Stewart Warner tach added on the dash, Stewart Warner underdash gauges. – From the Les Quam collection. 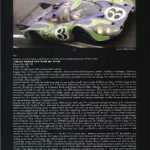 Extensive show and magazine feature history. Restored in the 1990s. Colin Comer bought it 10 years ago and refreshed it. Excellent paint and chrome. The seats, steering wheel and tach show a little bit of wear but that’s it. Still gorgeous and thoroughly documented. – Sold for $187,000 at Barrett-Jackson Scottsdale 10 years ago and a record-setter here, the star of the auction as it deserved to be. 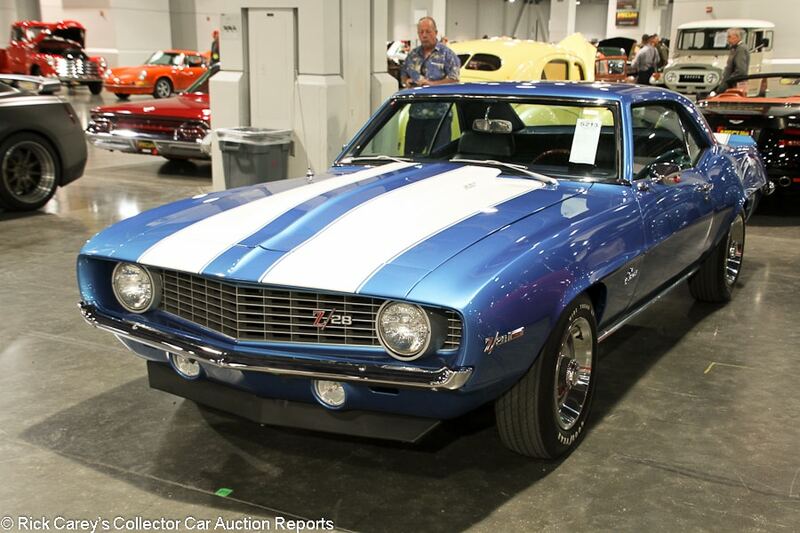 Lot # S213 1969 Chevrolet Camaro Z/28 Sport Coupe; S/N 124379N662339; Lemans Blue, White stripes/Dark Blue vinyl; Recent restoration, 2+ condition; Hammered Sold at $66,000 plus commission of 10.00%; Final Price $72,600. With Reserve. – 302/290hp, 4-speed, Rally wheels, Goodyear Wide Tread GT tires, cowl induction hood, rosewood steering wheel, spoilers, power brakes, Positraction, AM radio. – Represented as matching numbers engine. Excellent paint and chrome. Even gaps. Spotless fully restored interior. Tidy underneath. Freshly restored, well equipped and gorgeous. A very good car restored to showroom condition. – Not sold at a $50,000 high bid at Mecum Anaheim in 2015, but even this considerably higher result is a bit modest for such a good car and the new owner took home both a good car and a good value. 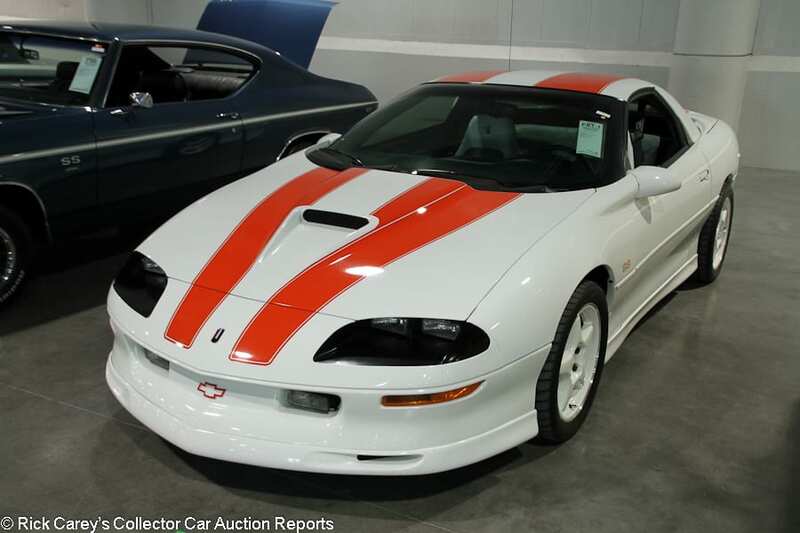 Lot # F81.1 1997 Chevrolet Camaro Z/28 30th Anniversary Coupe; S/N 2G1FP22P3V2156351; White, Orange stripes/White leather with houndstooth cloth inserts; Unrestored original, 2- condition; Hammered Sold at $25,000 plus commission of 10.00%; Final Price $27,500. With Reserve. – 350/330hp LT4 engine, 6-speed, hood scoop, white wheels, Comp T/A tires, factory CD stereo. – Some surface rust on the chrome exhaust tips but it’s light and could be taken off. Several chips on the nose. Significant wear and some discoloration on the driver’s seat. A very good car for the most part, but worse than you’d think given the 17,787 miles. A nitpicky collector might not go for it, but it’s not a bad car. – About 1,000 30th Anniversary Camaros were built for 1997 and it was essentially just a cosmetics package, but another 100 or so like this car were put together by SLP with the more powerful LT4 engine. That explains this price, although given the car’s rarity and performance, it could have brought a few grand more without being expensive. 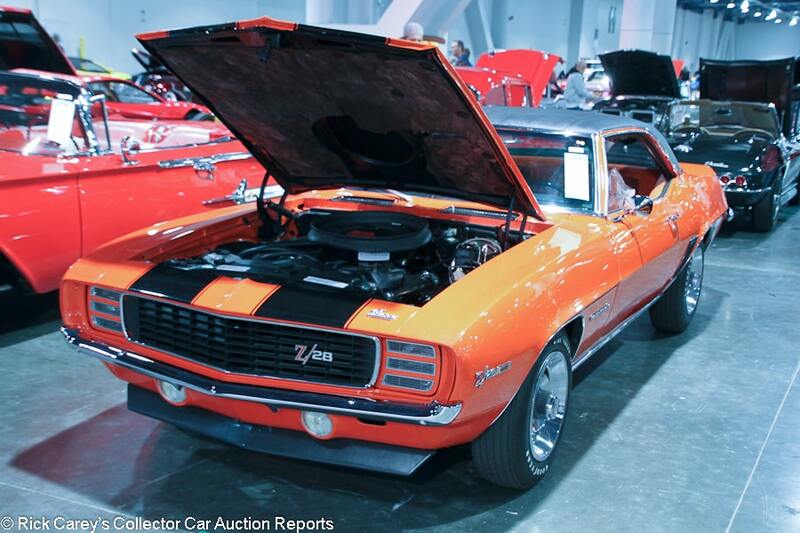 Lot # S181.1 1969 Chevrolet Camaro Z/28 RS 2-Dr. Hardtop; S/N 124379N629669; Hugger Orange, Black stripes and vinyl roof/Orange vinyl with Orange houndstooth cloth; Older restoration, 3+ condition; Not sold at Hammer bid of $65,000. With Reserve. – 302/290hp, 4-speed, RS trim, Rally wheels, Wide Tread GT tires, hidden headlights, dual mirrors, spoilers, Hurst shifter, factory AM radio, power brakes, power steering. – Very good fully restored engine bay and underbody. Very good older paint, chrome and roof vinyl. Factory gaps. Lightly scratched original rear glass. Some wear on the steering wheel and lightly faded gauges, but otherwise very good interior. Fully restored and mostly very good. – Sold for $64,900 at Mecum Houston earlier this year, then not sold at a $60,000 high bid at Mecum Monterey back in August. The Camaro market is speaking with remarkable consistency about this car and its sound but compromised condition. The seller should listen to the conversation and be guided accordingly. 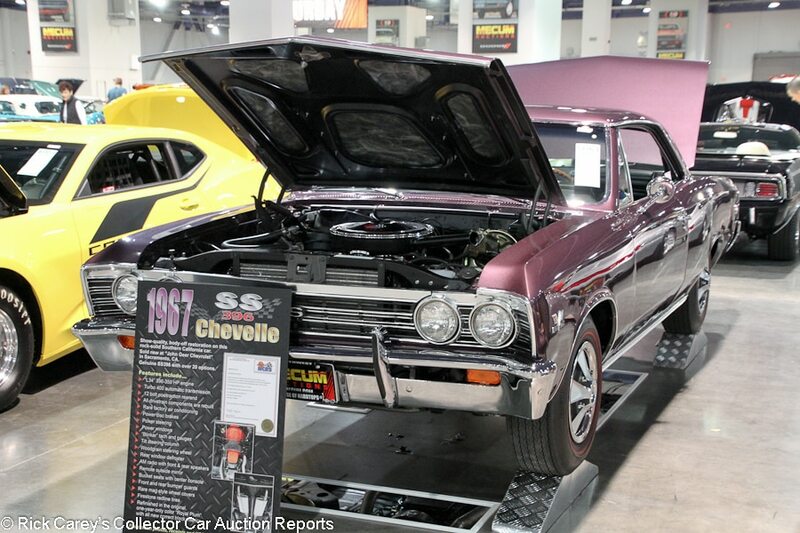 Lot # S136.1 1967 Chevrolet Chevelle SS 396 2-Dr. Hardtop; S/N 138177Z111404; Royal Plum/Black vinyl; Recent restoration, 1- condition; Hammered Sold at $55,000 plus commission of 10.00%; Final Price $60,500. With Reserve. – 396/350hp L34 engine, automatic, wheel covers, red line tires, power steering, power brakes, Positraction, factory air conditioning, power windows, tilt steering column, woodgrain steering wheel, AM radio, remote mirror, bucket seats, floor shift, console clock. – Excellent paint, chrome, engine bay and underbody. Even gaps. Some chrome is coming off the shifter and the original mirror is lightly pitted. Those are odd oversights in a car that is otherwise fantastic and meticulously restored. It’s incredibly well equipped, very well restored and finished in its funky original one-year-only color. – Reported sold for a modest $37,950 three months ago at Mecum’s Monterey auction and turned here for a healthy profit, but no more than the lavish options list deserves. It was bought right in an opportunistic purchase and that’s where the money is made. Lot # S172 1965 Chevrolet Corvette Convertible; S/N 194675S121582; Engine # 5121582; Glen Green/Tan vinyl; Older restoration, 2- condition; Not sold at Hammer bid of $75,000. With Reserve. – 396/425hp L78 engine, 4-speed, side exhaust, 3.96 Positraction, centerlock wheels, gold line tires. – Represented as matching numbers. Very good restored engine bay and underbody. Good older paint and chrome with a webbing out crack in the middle of the hood. Good, lightly worn interior. Sound and fully restored, but not super fresh. – Not sold at a $70,000 high bid at Mecum Los Angeles earlier this year, then not sold at a $65,000 high bid at Russo and Steele Monterey earlier this year. Slightly better luck in Vegas, but still not quite what this car deserves, although diverse bidders are speaking with remarkable clarity and consistency. 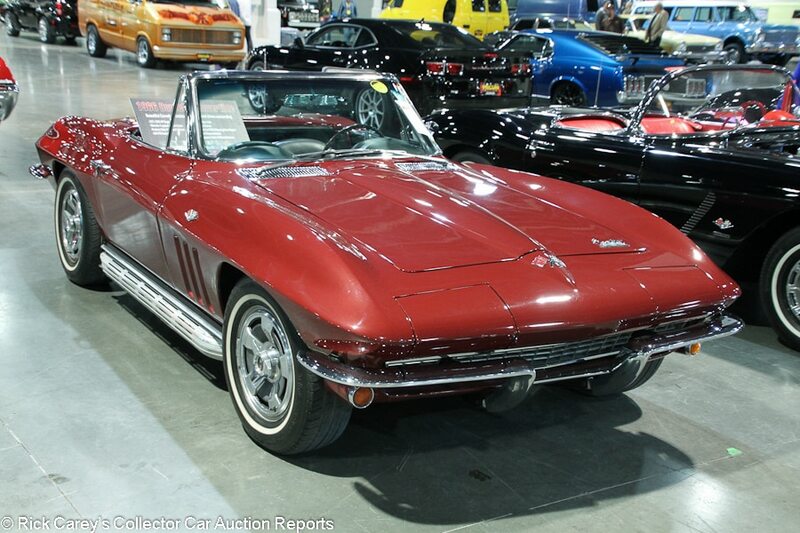 Lot # F116 1966 Chevrolet Corvette Convertible; S/N 194676S107079; Milano Maroon/Black vinyl; Visually maintained, largely original, 3 condition; Hammered Sold at $55,000 plus commission of 10.00%; Final Price $60,500. With Reserve. – 327/300hp, 4-speed, centerlock alloy wheels with trim rings, narrow whitewalls, side exhaust, Positraction, AM/FM radio. – Originally sold in Canada. Good older paint and chrome. Large chip in the right headlight door and another behind the passenger’s door. Lightly scratched exhaust surrounds. The wheels look pretty rough. Cloudy original gauges. Lightly worn underneath. Mostly original and nothing is an eyesore, but this is a driver with little more than the factory side exhaust to distinguish it. – Strong but not silly money for an ordinary car. This price could have bought an L79 in this condition, which come with another 50 hp. 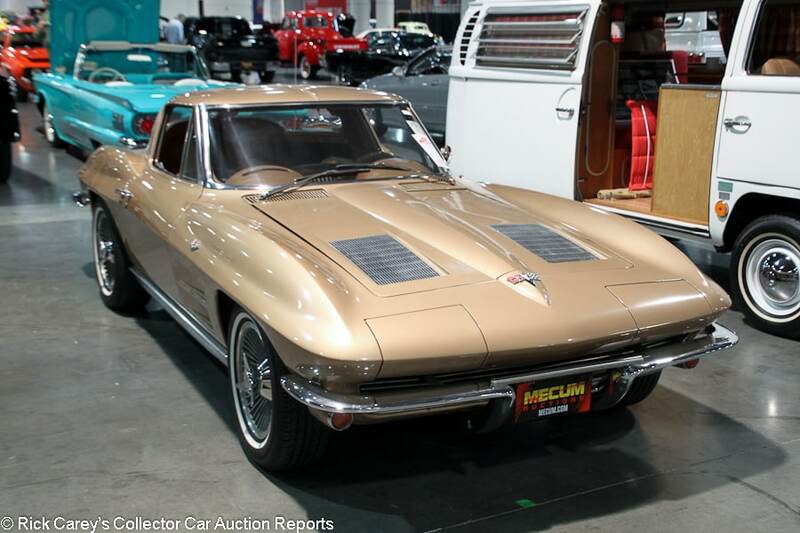 Lot # F267 1963 Chevrolet Corvette Coupe; S/N 30837S113718; Saddle Tan/Tan vinyl; Visually maintained, largely original, 3 condition; Hammered Sold at $59,000 plus commission of 10.00%; Final Price $64,900. With Reserve. – 327/300hp, automatic, centerlock wheels, narrow whitewalls. – Single repaint, but it’s so old that it almost looks original. It’s faded, and there are numerous chips, scratches and cracks. Original brightwork. The exhaust has been replaced, but the rest of the car is unrestored underneath. Sound interior that is original apart from newer upholstery. Almost as basic as it gets and not in great shape, but it’s a Split Window and that counts for something. – An unremarkable car bought at an appropriate price. This car is a bit of a tough sell. It’s not a collector quality Split Window, and people who want a C2 to drive would be more attracted to later, improved cars in better condition for this sort of money. 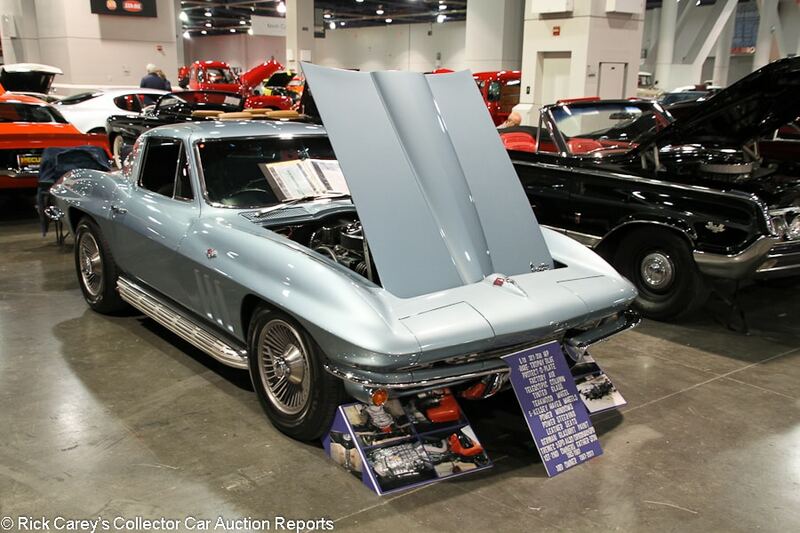 Lot # S179 1966 Chevrolet Corvette Coupe; S/N 194376S104022; Engine # 6104022; Nassau Blue/Dark Blue leather; Older restoration, 2- condition; Not sold at Hammer bid of $73,000. With Reserve. – 327/350hp L79 engine, Tremec 5-speed, side exhaust, factory air conditioning, centerlock wheels, Kumho tires, teakwood steering wheel, later Kenwood cassette stereo with Pioneer speakers in the back, power steering. – Tidy older restored engine bay and underbody. Very good paint and chrome. Very light wear to the seats. No other paperwork represented, but an attractive older restoration. – The 5-speed adds a positive contribution to this Corvette’s driving experience, if not to its originality and it is the latter than counts to most Corvette collectors. The bid is reasonable for the equipment and condition and could have been taken. Lot # S140.1 1970 Chevrolet Corvette Coupe; S/N 194370S410162; Engine # 70S410162; Bridgehampton Blue, White/Black Vinyl; Older restoration, 3+ condition; Hammered Sold at $37,000 plus commission of 10.00%; Final Price $40,700. No Reserve. – 350/370hp LT1, 4-speed, Rally wheels, Firestone Wide Oval tires, Delco radio. – Represented as the matching numbers engine. Used, partially restored engine bay. Small crack in the left front fender and some chips at the back of the front bumper but mostly very good older paint and chrome. Newer upholstery and carpets but the rest of the interior, specifically the gauges and switchgear, is a bit dull and tired. Mostly restored at some point, then driven over a period of years, not months, and now in unremarkable condition. – Not sold at a $37,000 high bid at Mecum Dallas a few months ago. The car arguably deserves more attention, which would give it more buyer appeal, but the market has spoken twice and this is what happens when a car with needs is offered without reserve. 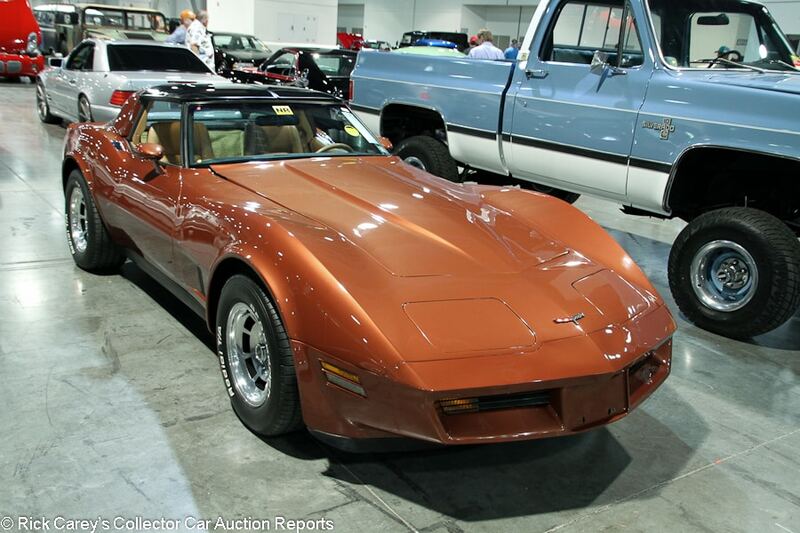 Lot # F45.1 1981 Chevrolet Corvette Coupe; S/N 1G1AY8761B5105540; Dark Bronze/Tan; Unrestored original, 2 condition; Hammered Sold at $16,500 plus commission of 10.00%; Final Price $18,150. No Reserve. – 350/190hp, automatic, glass T-tops, Radial T/A tires, air conditioning, power windows, factory cassette stereo. 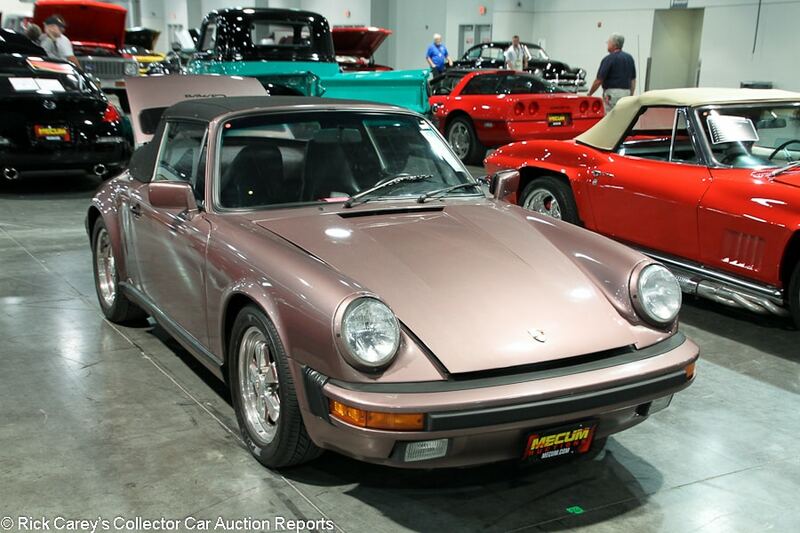 – Rare Dark Bronze color, apparently one of 432. The paint is very good and the car is very tidy underneath. The seats and switchgear are lightly worn, but this looks like a pampered car with far fewer miles than the 92,008 on the odometer. – Slightly favorable to the seller given the automatic and the high mileage, but the new owner has nevertheless acquired an attractive driver that looks better than most of the other late C3s out there and is in a color that will attract attention among its peers. 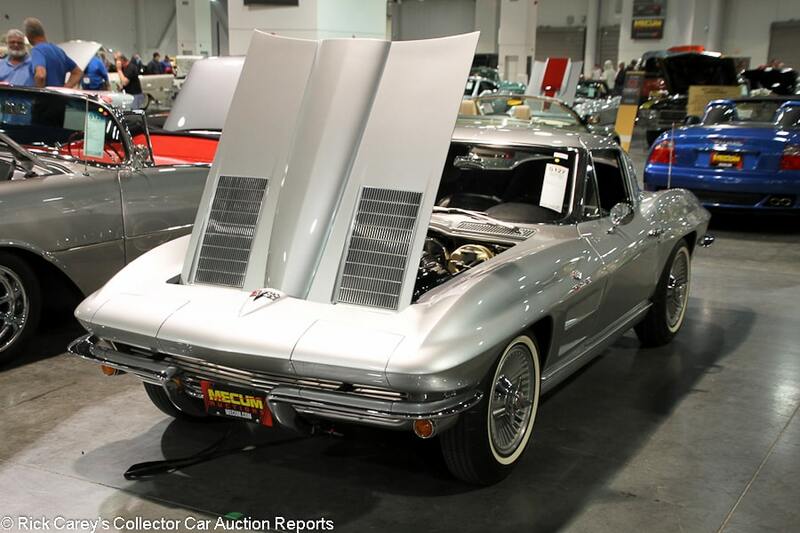 Lot # S127 1963 Chevrolet Corvette FI Coupe; S/N 30837S105147; Sebring Silver/Black vinyl; Older restoration, 2 condition; Hammered Sold at $135,000 plus commission of 10.00%; Final Price $148,500. With Reserve. – 327/360hp fuel injection, 4-speed, centerlock alloy wheels, narrow whitewalls, power brakes, power windows. – Represented as matching numbers engine. Nearly spotless engine bay and underbody. Very good paint and chrome. Very good interior. Not much in the way of documentation, but it is gorgeous, fully restored and very well equipped. – The solid lifter fuel injected engine makes this pretty much the ultimate Split Window and the accurate, not overdone restoration complements its specifications. It lacks only the confidence of NCRS or Bloomington Gold judging. It is a sound value at this price and could have brought somewhat more had it been judged correct. 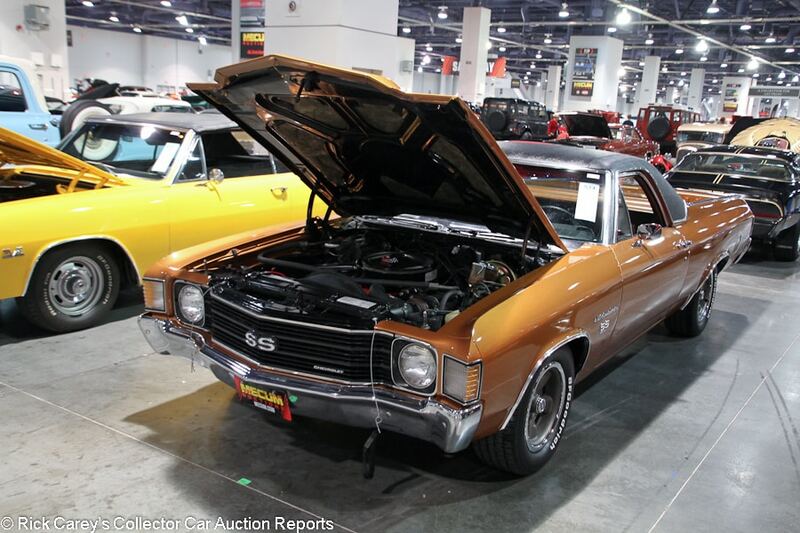 Lot # S14 1972 Chevrolet El Camino SS 454 Pickup; S/N 1D80W2K516444; Mojave Gold, Black stripes and vinyl roof/Brown, Black vinyl; Older restoration, 2- condition; Hammered Sold at $25,000 plus commission of 10.00%; Final Price $27,500. No Reserve. – 454/270hp LS5 engine, automatic, hood pins, factory air conditioning, power steering, power brakes, AM/FM radio, tilt steering column, cruise control, column shift. – Represented as matching numbers. Lightly scratched front bumper. Clean and restored but not overly detailed engine bay. Very good paint other than some blemishes in the bed. Very good interior. Light road wear underneath. A handsome older restoration with some light wear and age. – A year ago this would have been a 350hp LS5, but it’s 1972 and the authorities have declared horsepower indecent. In fact it makes little difference in how much rubber this El Camino can burn off its rear wheels, it just drops the bar for bragging rights and this is a low-bragging-rights-bar price for a vehicle that a year or two earlier in manufacture would have brought twice this and more. 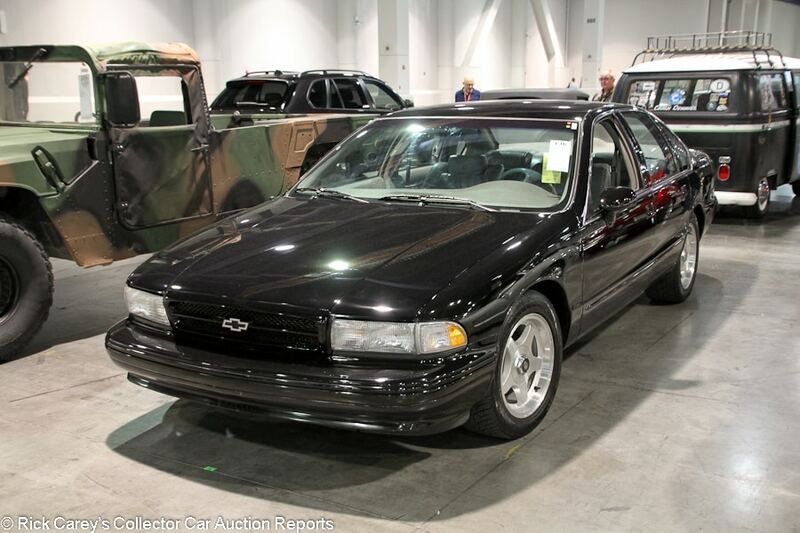 Lot # F16 1994 Chevrolet Impala SS 4-Dr. Sedan; S/N 1G1BN52P6RR166056; Black/Grey leather; Unrestored original, 3 condition; Not sold at Hammer bid of $11,000. With Reserve. – 350/260hp, automatic, alloy wheels, Hankook tires, bucket seats, console, CD stereo, power windows, air conditioning. – Tired original paint with lots of small chips and scratches on the front of the car. The wheels are a little scratched up. The driver’s door sticks out at the bottom. Some light wear on the switchgear and seats, but the interior is mostly good. Represented with 51,000 miles. Nothing more than an average used car. – Rerun late Friday as F312 with the same result. These ’90s rear-drive sleepers have gotten a lot of recent attention in the collector car community not only as the last rear-drive Impalas but also as one of the last good-old-fashioned traditional rear-drive American sedans with a big V-8. getting the most attention, though, are pampered low mileage examples. That’s not what this car is, and it showed as it got little attention when it crossed the block. 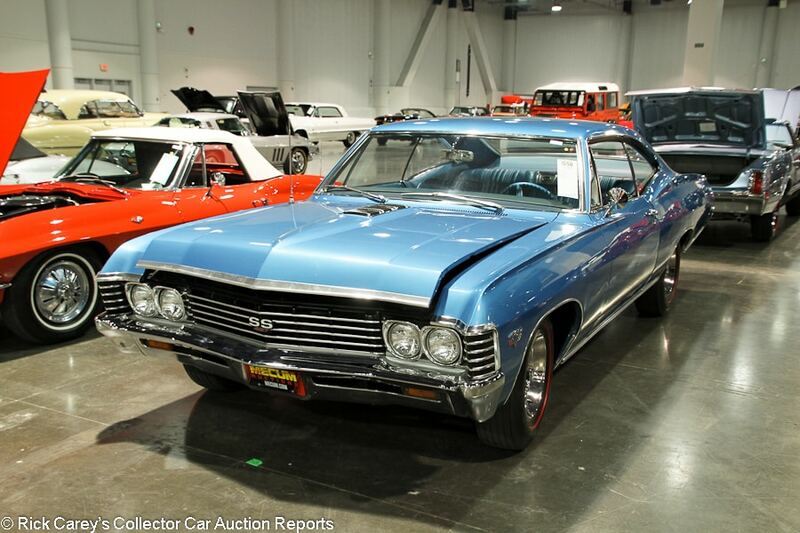 Lot # S58 1967 Chevrolet Impala SS 427 Sport Coupe; S/N 168877U111001; Marina Blue/Blue vinyl; Older restoration, 2- condition; Hammered Sold at $50,000 plus commission of 10.00%; Final Price $55,000. With Reserve. – 427/385hp L36 engine, 4-speed, Rally wheels, red line tires, bucket seats, console, floor shift, Sun tach on the column, Sun underdash gauges, factory AM radio, Protect-O-Plate. – Nearly spotless engine bay. Lightly scratched window frames. Uneven door and trunk gaps. The brightwork around the taillights is pitting lightly. Lightly scratched rear glass. Very good paint, chrome and interior aside from scratches on the console. Restored in 2008 but still a fundamentally very good car with desirable colors and equipment. There are only small cosmetic things to pick on. – Sold for $48,600 at Mecum Chicago in 2014 with 18 more miles on the odometer since then. This result is only 13% more than three years ago, if only your health insurance had gone up so little. 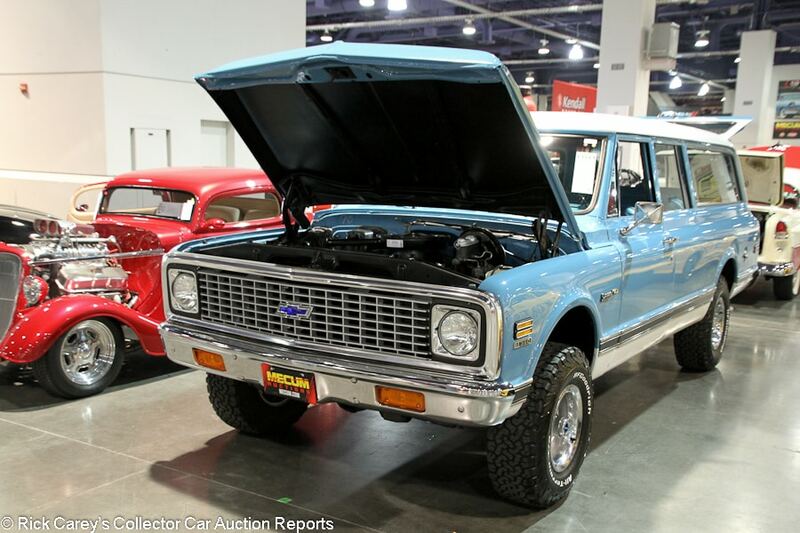 Lot # F12 1976 Chevrolet K10 Blazer Cheyenne Sport Utility Vehicle 4×4; S/N CKL186F211466; Hawaiian Blue, White/Brown vinyl; Visually maintained, largely original, 3 condition; Hammered Sold at $16,000 plus commission of 10.00%; Final Price $17,600. With Reserve. – 350/165hp, automatic, roof rack, console, rear-mounted spare, roof rack, factory air conditioning, power steering, power brakes. – Paint is coming off and rust is showing through on the tail. Scratched up bumpers. Paint chipping off the drip rails. Masking errors around the windows. Paint cracks on the doors. The frame is a bit oxidized but nothing is rotten. Good partially restored interior. A bit rough around the edges but still a neat truck. – In keeping with the general trends seen at auction in 2017, this Blazer brought strong money. What happened with Broncos is happening with Blazers and indeed most of the rest of the vintage truck and SUV market. 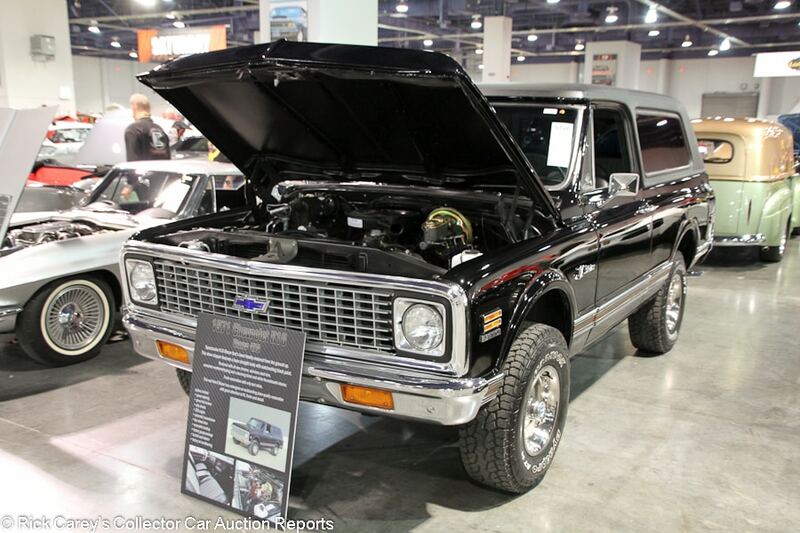 Lot # S126 1971 Chevrolet K5 Blazer CST Open Top Utility 4×4; S/N KE181S623646; Black/Black vinyl with houndstooth cloth inserts; Recent restoration, 2+ condition; Not sold at Hammer bid of $45,000. With Reserve. – 350/250hp, automatic, Hankook tires, power steering, power brakes, factory air conditioning, bucket seats, column shift, console, pushbutton radio. – Fully restored engine bay and underbody. Very good paint. Excellent chrome. Even gaps. Excellent fully restored interior. Freshly restored to better than new condition. – Restorations of this caliber on a Blazer are further evidence that interest in the trucks is rising fast, as is the fact that the consignor was sufficiently optimistic about finding a more generous bidder to turn down a $45,000 bid. 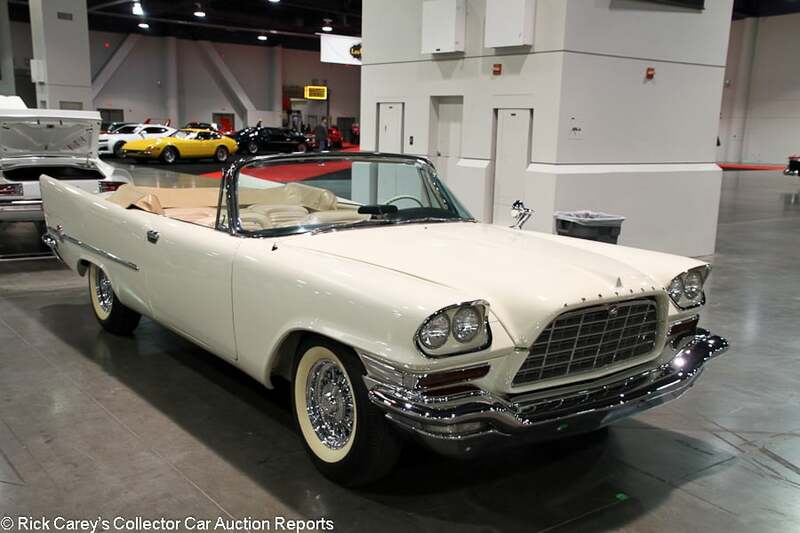 Lot # S110.1 1957 Chrysler 300C Convertible Coupe; S/N 3N572586; White/Beige leather; Older restoration, 3+ condition; Hammered Sold at $86,000 plus commission of 10.00%; Final Price $94,600. With Reserve. – Wire wheels, whitewalls, boot cover, dual quads, power steering, pushbutton automatic, bench seat, pushbutton radio, heater, power windows. – One of 484 300C convertibles. Aside from a few chips behind the right headlight bezel, three cracks on top of the passenger’s side door and lightly scratched door handles, the older paint and chrome are very good. The seats are lightly wrinkled and the aluminum bits in the door panels are a little beat up, plus the cover on the radio has a crack in it. The interior still mostly presents well, however. Light road wear underneath and lightly discolored whitewalls. The hood and door fit is a little erratic. This car was restored a while ago and has plenty to pick on, but it’s a fast and stylish Chrysler letter car that you could still be proud of. – A pretty modest result for a convertible 300C without major problems. Barrett-Jackson sold it way back in 1999 for $61,600 and it would not have been unreasonable for it to have brought well over $100,000 here. 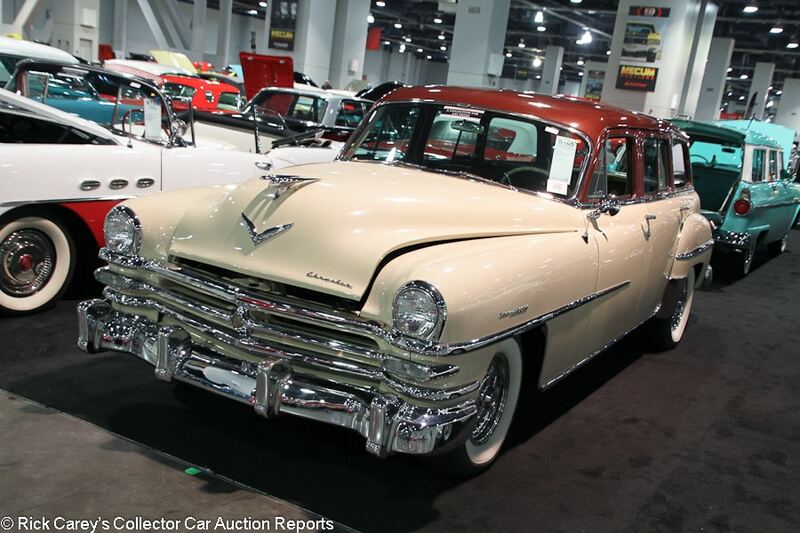 Lot # S105 1953 Chrysler New Yorker Town & Country Station Wagon; S/N 76557679; Brown, Beige/Brown vinyl; Older restoration, 2- condition; Hammered Sold at $48,000 plus commission of 10.00%; Final Price $52,800. With Reserve. – 331/180hp, GM automatic transmission, wire wheels, whitewalls, Firepower engine, Vintage air conditioning, dash clock, factory AM radio, 12-volt electrics. – Has a GM automatic in it. Very clean engine bay. Very good paint and chrome. Uneven door gaps. Very good interior. Not a totally correct car, but fully restored and attractive. – Sold at Barrett-Jackson Las Vegas in 2012 for $52,800 and its result here substantiate that not much has happened in the ’53 T&C Station Wagon market in five years. 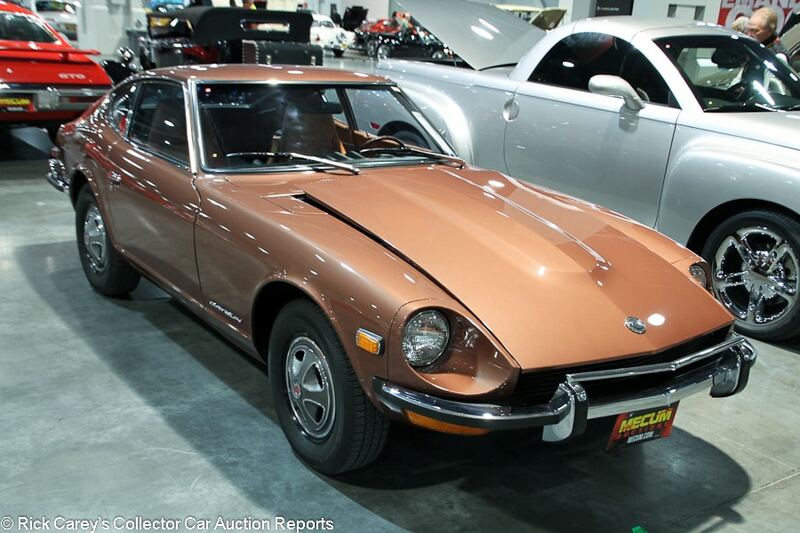 Lot # F193 1973 Datsun 240Z Coupe; S/N HLS30138683; Bronze/Brown vinyl; Visually maintained, largely original, 2 condition; Not sold at Hammer bid of $27,000. With Reserve. – Wheel covers, wood shift knob, pushbutton AM/FM radio, dash clock. – Unrestored other than one repaint. Zeibart coated when new. Tidy maintained engine bay. Very good paint. Very good interior. Really a very good, unmolested and nearly all original Z-car showing 49,162 believable miles. A good find. – This is definitely a time warp car, and it’s pretty remarkable to find a 240Z that has been so well preserved. But it’s arguably not so remarkable as to warrant a 30 grand price tag. The reported high bid seems fair. 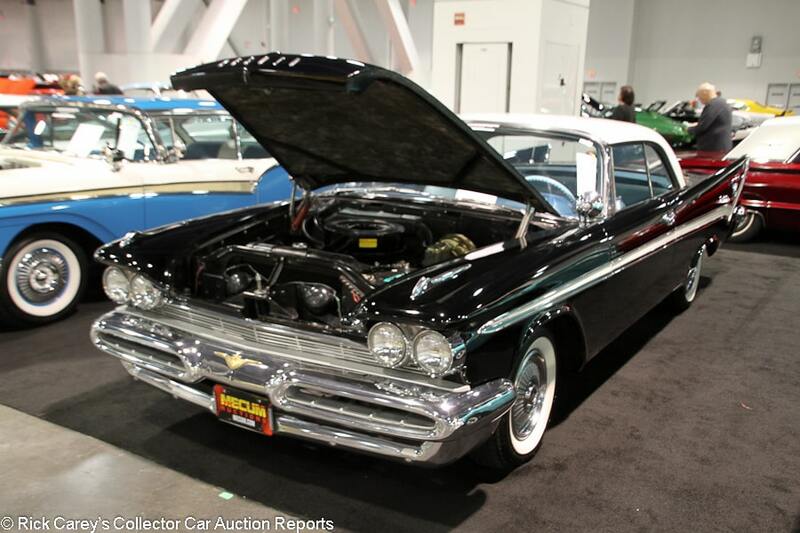 Lot # S129 1959 DeSoto Firesweep Sportsman 2-Dr. Hardtop; S/N M412104223; Black, White roof/Blue vinyl, cloth; Visually maintained, largely original, 3+ condition; Hammered Sold at $33,000 plus commission of 10.00%; Final Price $36,300. With Reserve. – 361/290hp, automatic, wheel covers, whitewalls, dual mirrors, power steering, power brakes with front discs, pushbutton automatic, pushbutton radio, curb feelers. – Dull, tired original chrome. Decent older paint. Tidy and maintained but mostly unrestored engine bay and underbody. Good original interior with some scratches on the dash top. An inherently attractive and fairly rare car, but no better than a driver in this mostly unrestored condition. – Sold for $35,750 at Mecum Anaheim this year and for the same price there in 2015, a history which endorses the nearly identical result here. 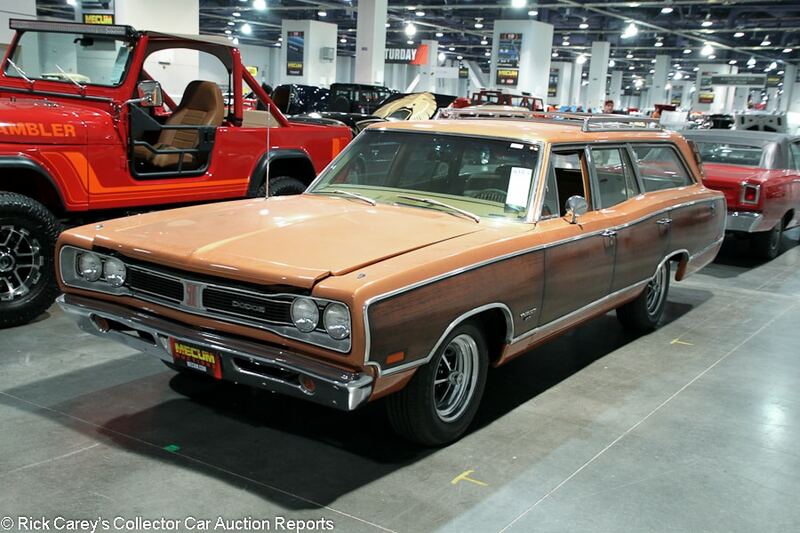 Lot # S15.1 1969 Dodge Coronet 500 Station Wagon, 3-Seat; S/N WP46G9G173334; Copper, Woodgrain/Brown vinyl; Cosmetic restoration, 3+ condition; Not sold at Hammer bid of $13,000. With Reserve. – 383/290hp upgraded with a 4-barrel, automatic, roof rack, three-row seating, factory radio, factory air conditioning, power steering, power brakes, Magnum wheels, blackwalls. – Decent older paint and original chrome. The roof rack is dull and pitted. Unrestored but dry and tidy underneath. Very good interior with what looks like newer seats and carpets. A driver, but a good one and when was the last time you saw a Coronet wagon? – A good, sound car with enough factory conveniences to be fun to use but even at that this price should have been sufficient to separate it from its owner. 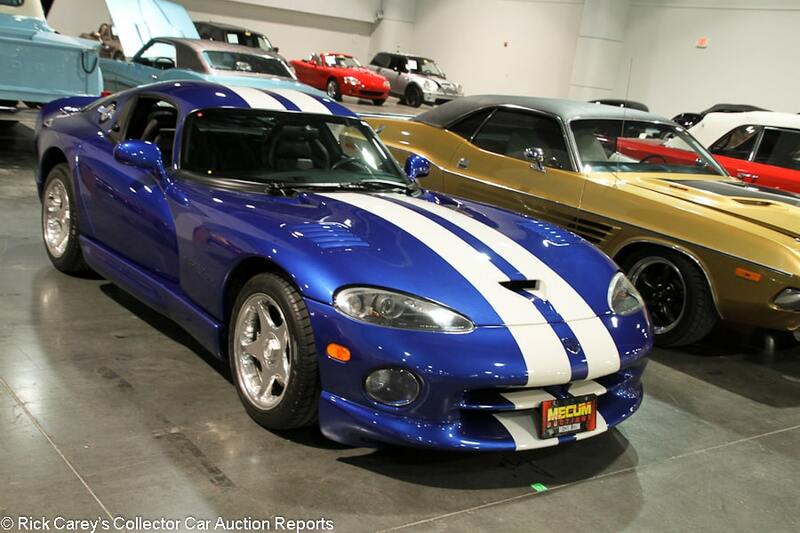 Lot # S17 1996 Dodge Viper GTS Coupe; S/N 1B3ER69E7TV200055; Viper Blue, White stripes/Black leather; Unrestored original, 2 condition; Hammered Sold at $52,500 plus commission of 10.00%; Final Price $57,750. With Reserve. – 488/415hp, 6-speed, air conditioning, power windows, factory CD stereo. – Showing 11,803 miles. No significant wear. Looks like a new car. – This is a strong but understandable price for an essentially new first year GTS, and so was the $50,000 it was bid to at Mecum Indy earlier this year. Bought right and with the Viper now out of production (at least for a while) it may have some upside if the new owner can resist driving it. 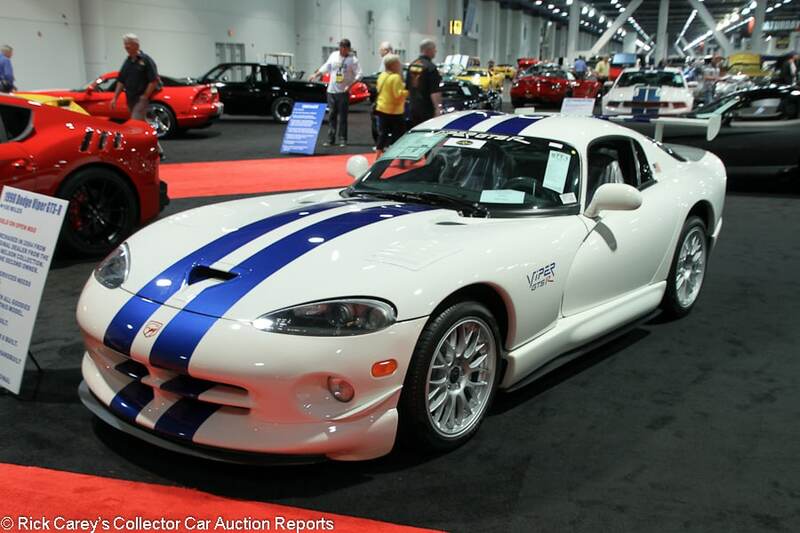 Lot # S71.1 1998 Dodge Viper GTS-R Coupe; S/N 1B3ER69E0WV401008; White, Blue stripes/Black, Blue; Unrestored original, 2 condition; Hammered Sold at $124,000 plus commission of 10.00%; Final Price $136,400. With Reserve. – 488/460hp, 6-speed, BBS wheels, wing, front splitter, side exhaust, Brembo brakes, power steering, CD stereo, power windows. – From the Les Quam collection. Showing 117 miles and presents like a new car. 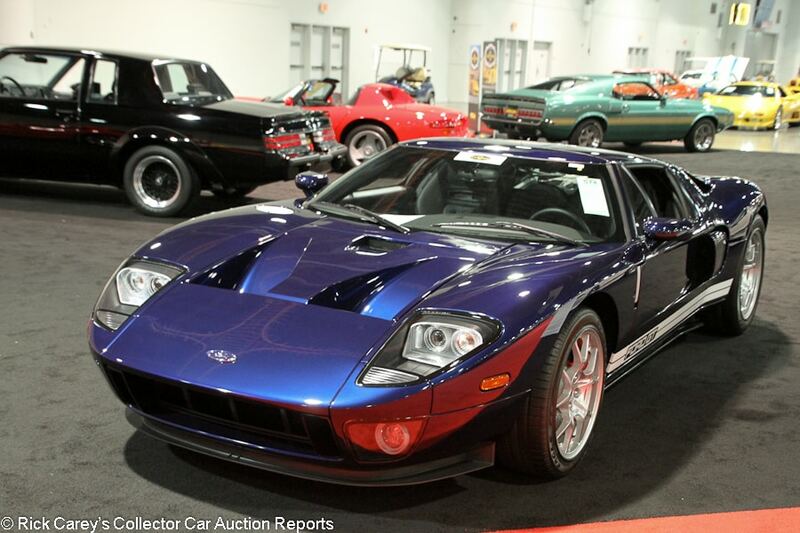 – Mecum has sold three GTS-Rs at auction this year, but this one is the most expensive. It also has the lowest mileage. List price was $82,500 back when these cars were new, so they are already well into ‘collectible’ territory. 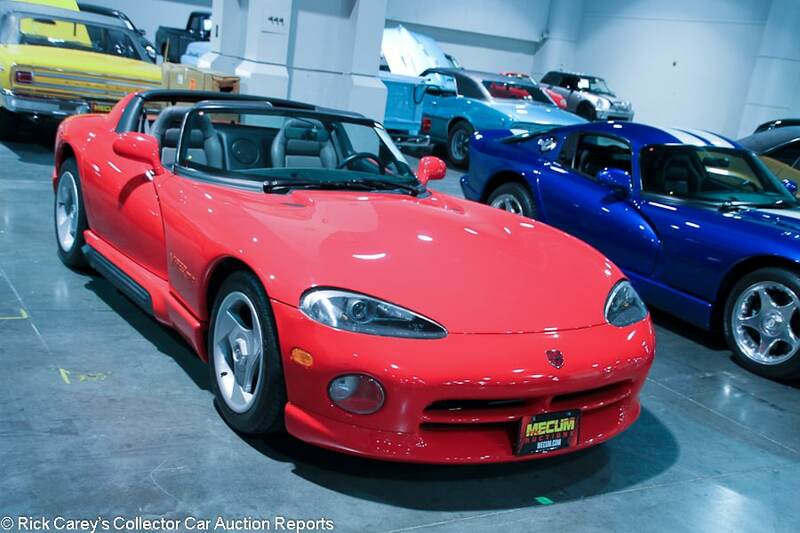 Lot # S18 1994 Dodge Viper RT/10 Roadster; S/N 1B3BR65E3RV102805; Red/Gray leather; Unrestored original, 2- condition; Hammered Sold at $41,500 plus commission of 10.00%; Final Price $45,650. With Reserve. – 488/400hp, 6-speed, factory cassette stereo, air conditioning. – Original tires. Showing just 1,150 believable miles. Very good original paint. There is a scuff on the passenger’s seat and a few scratches on the dash, but otherwise it presents like a new car. – Interest in Vipers has been on the rise, and more prime low-mileage examples have been showing up at auction this year. There were 11 of them at this auction alone. This RT/10 brought an appropriately but not surprisingly high result. Lot # S207.1 1979 Ferrari 308 GTS Spider; S/N 29343; Red, Black Roof/Black leather; Unrestored original, 3+ condition; Not sold at Hammer bid of $50,000. With Reserve. – Momo steering wheel, power windows, air conditioning, aftermarket digital stereo. – Swirled original paint. Dirty wheels. Decent but older interior. Reasonably well kept considering the age and 43,323 miles, but not a great car by Ferrari standards. – Even a driver quality ’79 308 is a $60,000 car these days, so the decision to hold out for more here was understandable even though it was bid to the same level at Mecum Monterey three months ago. Lot # S193 1985 Ferrari 308 GTSi QV Spider; S/N ZFFUA13A4F0055621; Prugna/White leather; Unrestored original, 3+ condition; Hammered Sold at $43,000 plus commission of 10.00%; Final Price $47,300. With Reserve. – Momo steering wheel, Alpine stereo, white leather seats instead of the original black. – Some chips and scratches here and there but mostly good and finished in the rare color of Prugna. Fully serviced in September. Showing 40,943 miles. A solid, well cared for 308 with some miles on it. – Not sold at a $40,000 high bid at Mecum Anaheim last year. Whether it was worth the extra time and fees to bring this only slightly higher result is up to the seller, but the car had better luck the second time around even if the result is still pretty light. 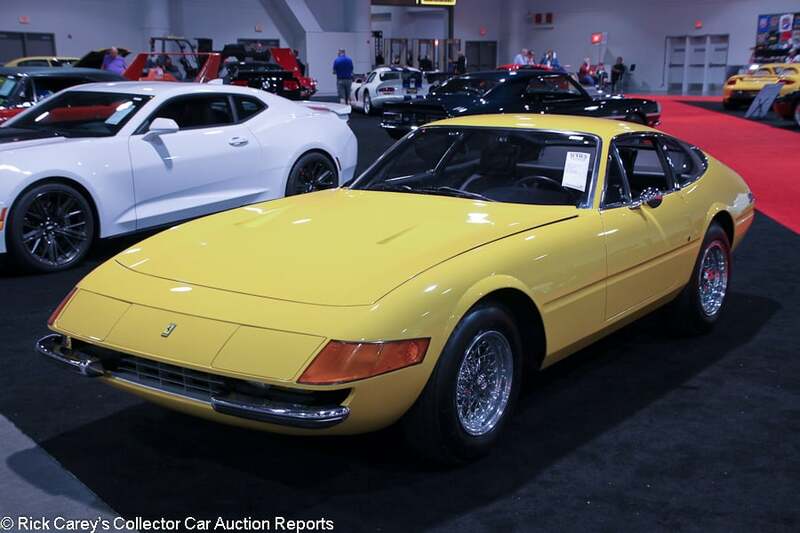 Lot # S103 1973 Ferrari 365 GTB/4 Daytona Coupe; S/N 16109; Yellow/Black leather; Older restoration, 2- condition; Not sold at Hammer bid of $675,000. With Reserve. – Borrani wire wheels, Michelin XWX tires, Ansa exhaust, Simpson lap belts, Momo leather-wrapped steering wheel, factory air conditioning, power windows, later Alpine cassette stereo. – Fully restored in the 1990s and 8,000 miles ago. Very good paint other than a chip at the back edge of the hood and two more small ones at the back edge of the passenger’s side door. Lightly scratched window frames. Very light wear to the steering wheel and seats but otherwise very good interior. Lightly used but tidy underneath. Well restored in the first place and quite well kept since. – Most recently bid to $650,000 in Monterey, but we’ve seen this car over and over again at Mecum auctions over the past couple of years. It repeatedly attracts high bids in the $600,000 to $800,000 range, and it’s clear that it isn’t going to go any higher. It’s put on 89 miles since Kissimmee 2016, giving satisfaction only to the Reliable and Mecum Transport drivers who keep hauling it from auction to auction where it is a reliable crowd draw. 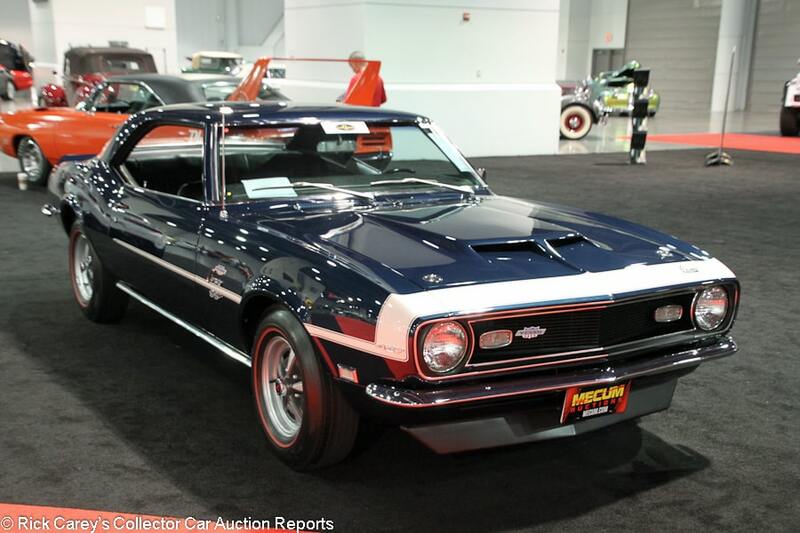 Its continuing presence at Mecum auctions is something of a joke, prompting speculation about what number the auctioneer will bring it to this time before it heads back to the transporter and Walworth, Wisconsin. 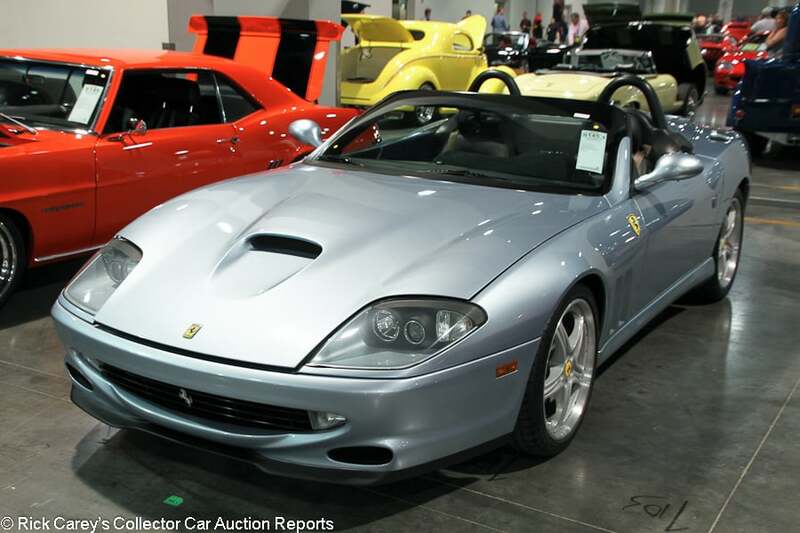 Lot # S145.1 2001 Ferrari 550 Barchetta Convertible; S/N ZFFZR52A410124162; Grigio Alloy/Black leather piped in Blue; Unrestored original, 2 condition; Not sold at Hammer bid of $240,000. With Reserve. – 5.5/485hp, 6-speed, modular wheels, red calipers, Pioneer stereo. – Very good paint. Negligible wear on the seats. Looks like a new car even though it’s showing 28,267 miles. Serviced in October. A rare Barchetta, open gate 6-speed and gorgeous colors. 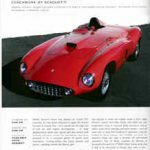 – The reported high bid is what 550 Barchettas were worth two or three years ago, not the $400K they’ve been looking for lately. The mileage may limit this example’s value, but not this much. 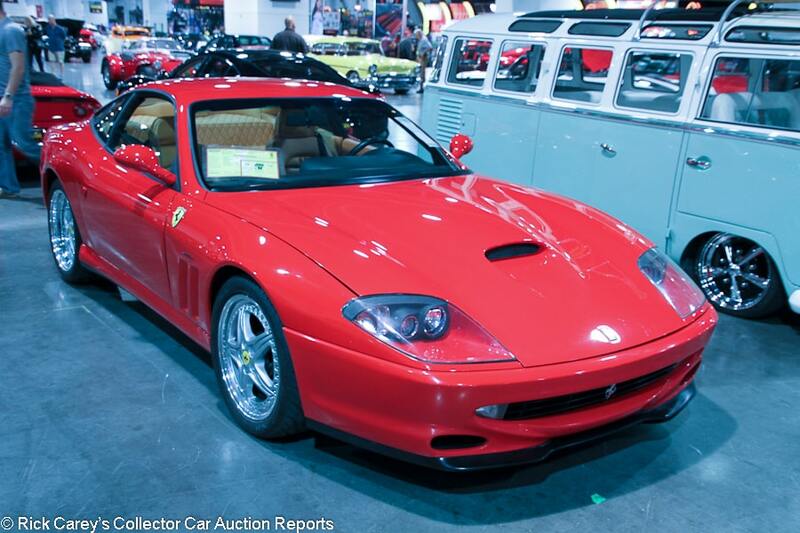 Lot # S198.1 2001 Ferrari 550 Maranello Coupe; S/N ZFFZS49A210123838; Red/Tan, Black leather; Unrestored original, 2- condition; Not sold at Hammer bid of $75,000. With Reserve. – 6-speed, modular wheels, red calipers, Daytona-style seats, carbon fiber interior trim, power windows, climate control. – Lightly swirled paint and some scratches on the headlight covers. Very good, like new interior. A pretty car, but given the 4,450 miles it probably should be better. – It should be more expensive as well, though. Any decent 550 deserves a six-figure price. 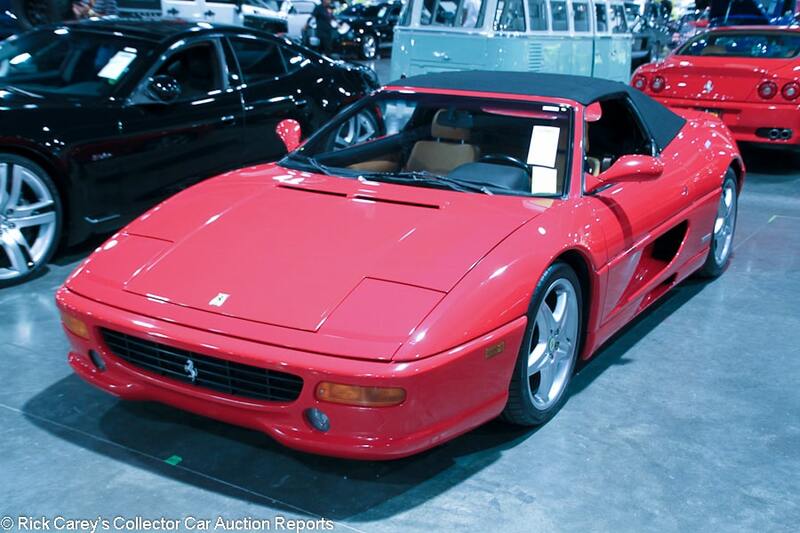 Lot # S207 1995 Ferrari F355 Spider; S/N ZFFPR48A9S0104046; Red/Tan leather; Black cloth top; Unrestored original, 2- condition; Not sold at Hammer bid of $55,000. With Reserve. – 6-speed, CD stereo, manual gearbox, comes with all books and tools. – Engine out service done in August. Showing 18,086 believable miles. Significant wear to the driver’s seat but otherwise presents very well. – Bad luck and the absence of right people in the room account for the weak high bid here. A good, recently serviced 355 with a manual gearbox and a clean Carfax is worth a lot more than this bottom-feeder offer. 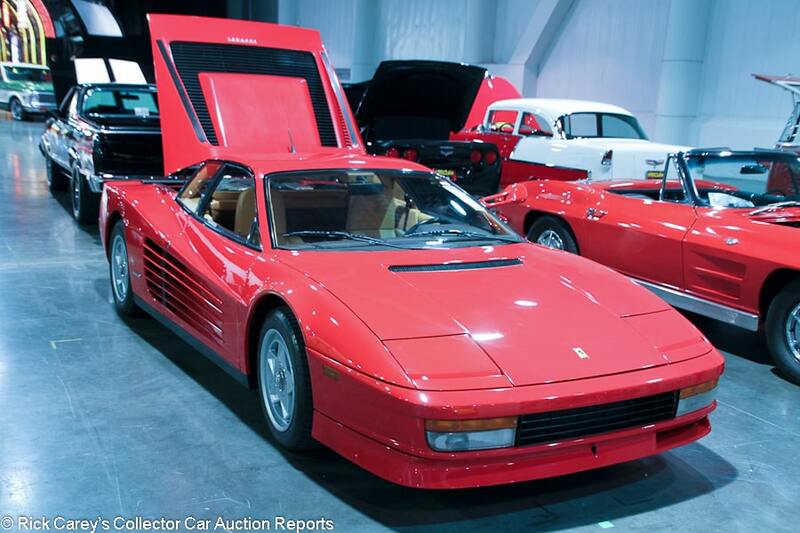 Lot # S174 1985 Ferrari Testarossa Coupe; S/N ZFFSA17A4F0058097; Rosso Corsa, Blue/Tan leather; Unrestored original, 3+ condition; Not sold at Hammer bid of $80,000. With Reserve. – Michelin TRX tires, Momo steering wheel, power windows, air conditioning. – Good but not great original paint with light detail scratches. The dash top is wavy. The seats are lightly worn and one of the interior switches is missing. The engine bay is pretty dirty, especially for a Ferrari. Showing 36,354 miles and definitely not perfect. It hasn’t led the pampered life of most of these cars. Noteworthy only in that it’s a flying mirror TR. – The reported high bid here wasn’t a generous offer, but this car doesn’t really deserve one and the number was worth considering. 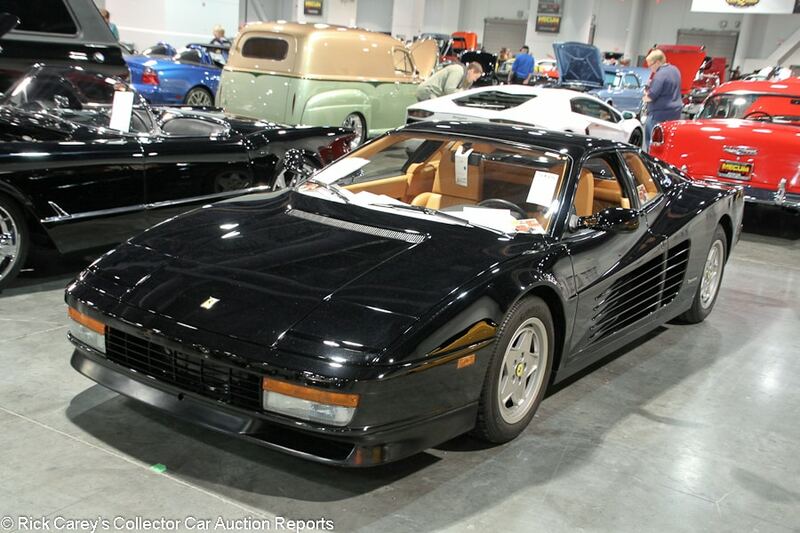 Lot # S125 1989 Ferrari Testarossa Coupe; S/N ZFFSG17A9K0081772; Black/Tan leather; Unrestored original, 2 condition; Not sold at Hammer bid of $147,500. With Reserve. – Momo steering wheel. – Same owner since 1989, and he bought it from Johnny Carson’s attorney. Showing 3,996 miles. Engine out service done in October. Very good paint. Very little wear on the seats, and there shouldn’t be given the mileage. Just about like new, and finished in attractive colors. – Even with the low mileage and pseudo-celebrity history this Testarossa should have been on its way to a new owner long before this bid. 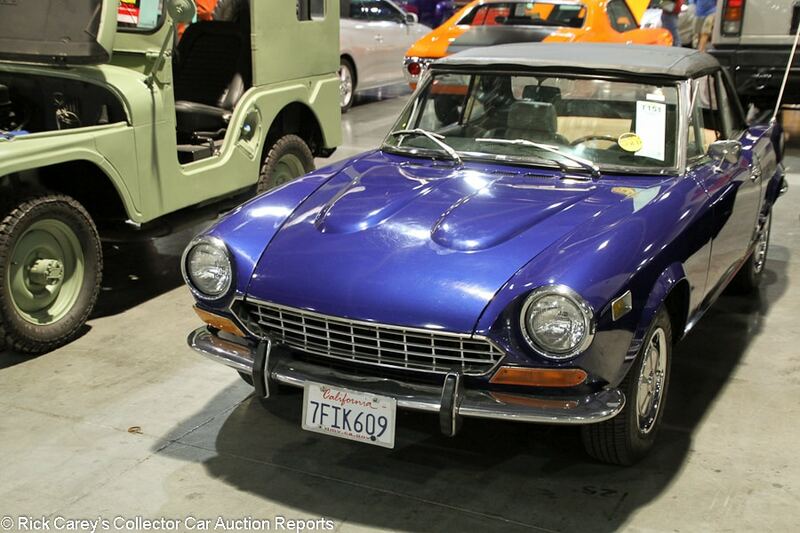 Lot # T151 1975 Fiat 124 1.8 Spider; S/N 124CS10099636; Metallic Blue/Beige vinyl; Black vinyl top; Visually maintained, largely original, 3 condition; Hammered Sold at $9,500 plus commission of 10.00%; Final Price $10,450. With Reserve. – Upgraded 2.0-liter engine, 5-speed, hub caps and trim rings, Sanyo cassette stereo, chrome shift knob, wood dash. – Good newer top. Decent repaint with light detail swirls, a big scratch in the middle of the hood and a large touch up on the left edge of the hood. Several scuffs on the trunk as well. Good original interior with a handful of small rips in the driver’s seat. Represented as restored, but presents like just a dry West Coast car with an older repaint. – Straightforward, fair money for both parties. 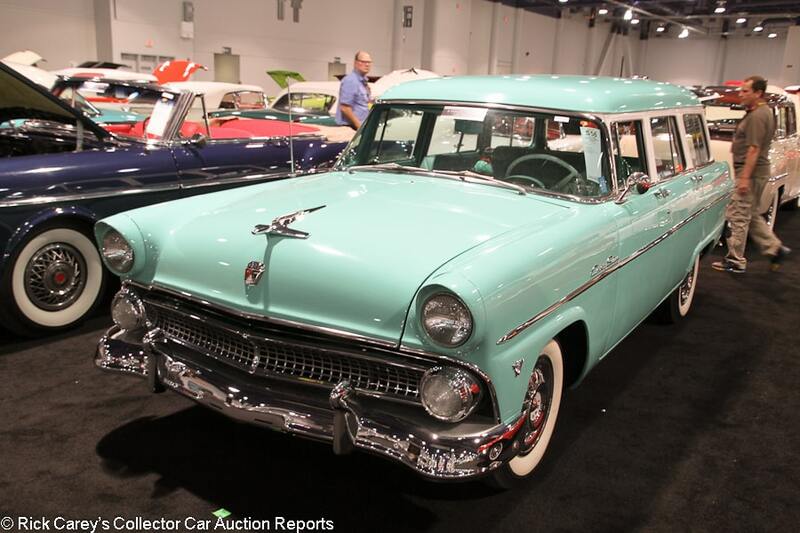 Lot # S56 1955 Ford Customline Country Sedan 4-Dr. Station Wagon; S/N U5LX169427; Turquoise, White/Turquoise; Cosmetic restoration, 3+ condition; Hammered Sold at $23,000 plus commission of 10.00%; Final Price $25,300. With Reserve. – 272/172hp, automatic, wire wheel covers, Firestone whitewalls, dual mirrors, pushbutton radio, dash clock, heater, power steering. – California car. Tidy engine bay. Very good paint and chrome. Uneven door gaps. Very good, lightly worn interior. The chassis is still wearing old undercoat dressed up with some paint. Straightforward, largely just cosmetic restoration of a handsome if basic vintage wagon. – Sold at Auburn Spring in 2011 for $14,575 then flipped at Barrett-Jackson Las Vegas four months later and in largely the same condition for $23,650. It’s added only 28 miles to the odometer since 2011. There were lots of neat old wagons at this sale. None of them was all that special but, like this one, most were charming and honest. This Country Sedan was on the expensive side for someone who just a wants a cool vintage family hauler, but the price wasn’t undeserved. Lot # S12 1957 Ford F-100 Pickup; S/N F10K7R28764; Light Blue, White roof/Dark Blue cloth; Truck restoration, 3+ condition; Hammered Sold at $22,500 plus commission of 10.00%; Final Price $24,750. With Reserve. – 272/171hp, 4-speed, hub caps, whitewalls, single spare, floor shift, dual mirrors, later radio. – Used restored engine bay. Decent older paint with some cracks behind the hood and a touch up on the driver’s door. Used frame. The bed is pretty beat up. Good interior. A used older truck restoration that has done some hauling. – And is still perfectly capable of light duty hauling during the week and looking good around town on the weekend. 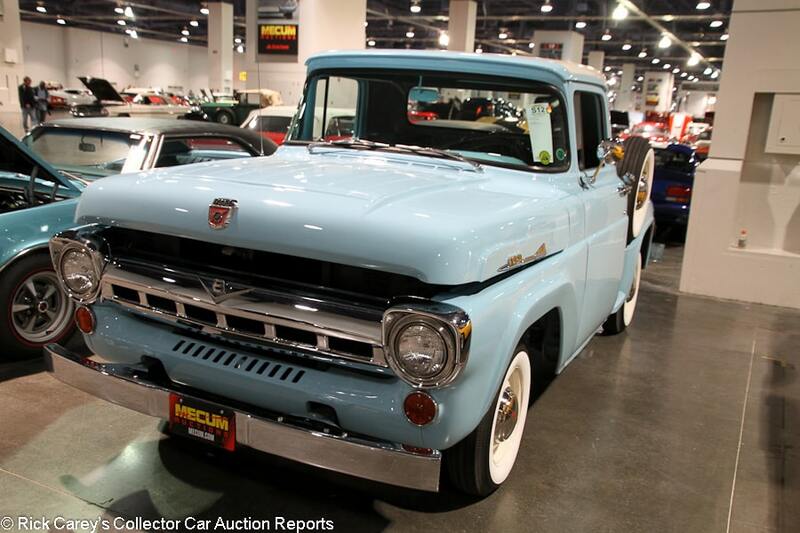 Its price is generous considering the condition but reflects the strength of pickup prices these days. 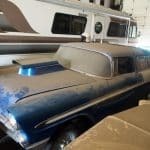 Lot # S119 1957 Ford Fairlane Club Sedan; S/N D7DV237248; Blue, White/Blue vinyl, White cloth; Older restoration, 2- condition; Hammered Sold at $18,500 plus commission of 10.00%; Final Price $20,350. With Reserve. – 312/245hp, automatic, wheel covers, whitewalls, fender skirts, dual antenna, Continental kit, dual spotlight mirrors, later cassette stereo, dash clock. – Very clean, partially restored engine bay. Dull original chrome, but the rest of the brightwork is good. Sound older paint. Good, very lightly worn restored interior. A handsome car that was fully restored but done on a budget and enjoyed a bit. – Sold at Mecum’s Dallas auction in 2012 for $19,610 and changing hands here for a teensy bit more this is an appropriately priced, sound and approachable entry level collector car in respectable condition. 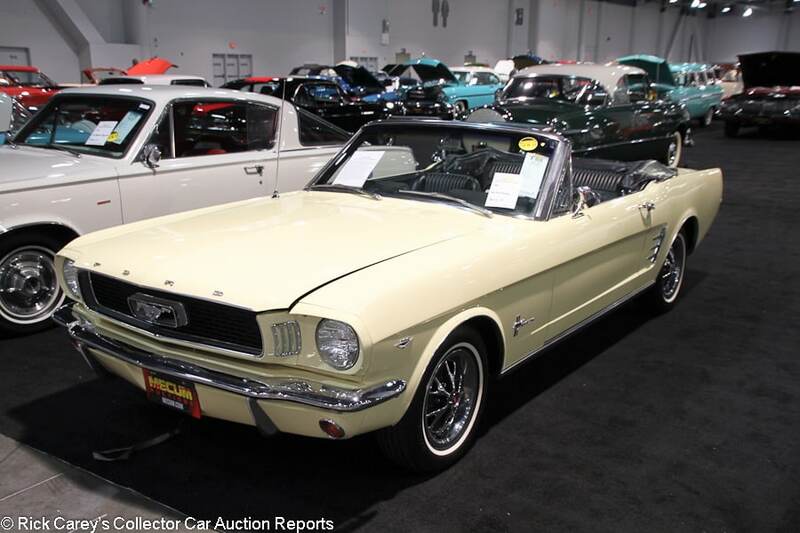 Lot # F88 1966 Ford Mustang Convertible; S/N 6R08C162510; Springtime Yellow/Black, White vinyl; Older restoration, 2- condition; Hammered Sold at $33,000 plus commission of 10.00%; Final Price $36,300. With Reserve. – 289/225hp, automatic, narrow whitewalls, power top, Pony interior, power steering, factory AM radio, boot cover. – Some light scratches on the front bumper. Good older paint with some touch ups on the right edge of the hood. Very good mostly restored interior. Tidy and restored underneath. A very pretty but not spectacular ’66 Mustang but it has a lot of eyeball appeal in these colors and would make a great weekend cruiser. 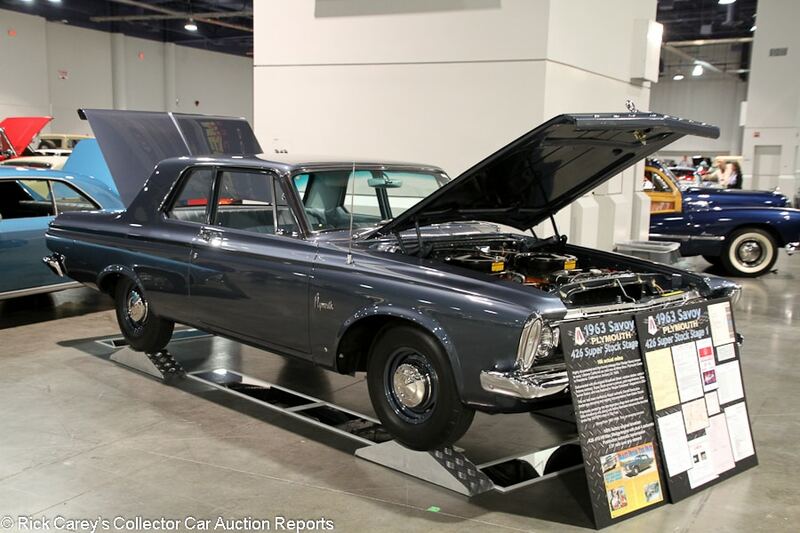 – This car sold at Barrett-Jackson Las Vegas in 2010 for $38,500, and this smaller result is largely just due to straightforward depreciation thanks to a few years of use on the restoration. It’s a fair transaction. 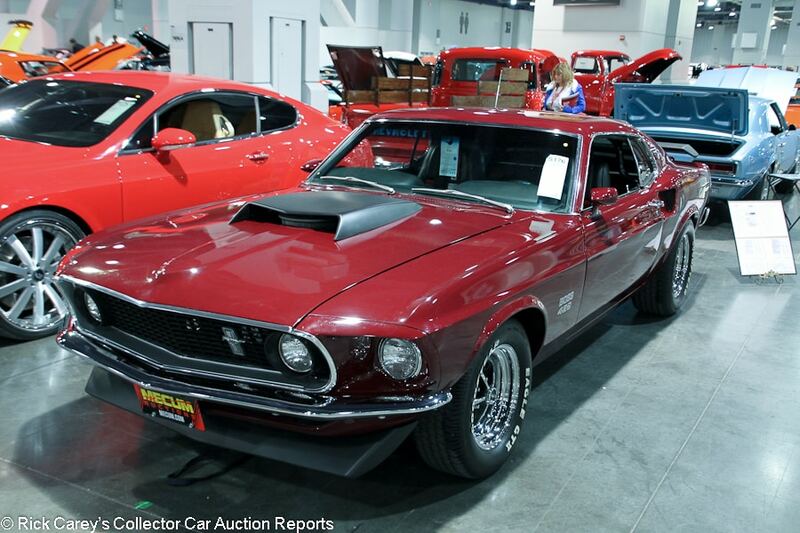 Lot # S176 1969 Ford Mustang Boss 429 SportsRoof; S/N 9F02Z159781; Royal Maroon/Black vinyl; Modified restoration, 2- condition; Hammered Sold at $200,000 plus commission of 10.00%; Final Price $220,000. With Reserve. – 429/375hp, 4-speed, Magnum 500 wheels, Goodyear Eagle GTII tires, spoilers, window slats, 3.91 Traction-Lok, Mustang II front suspension, woodrim steering wheel, console, Philco radio, dash clock, newer aftermarket gauges, KK #1393. – Chips around the left edge of the hood. Scratched door handles and window frames. Very good fully restored interior. Very tidy underneath. A documented Boss 429, but not done yesterday and with a modified front end with Mustang II suspension. – If the car card didn’t tell us of the Mustang II front end no one would have noticed this functional but otherwise pointless modification that suggests something more sinister might have made replacing the crossmember and suspension necessary. Given the modification and uncertainty this is a generous result that has no bearing on the values of stock restored Boss 429s. 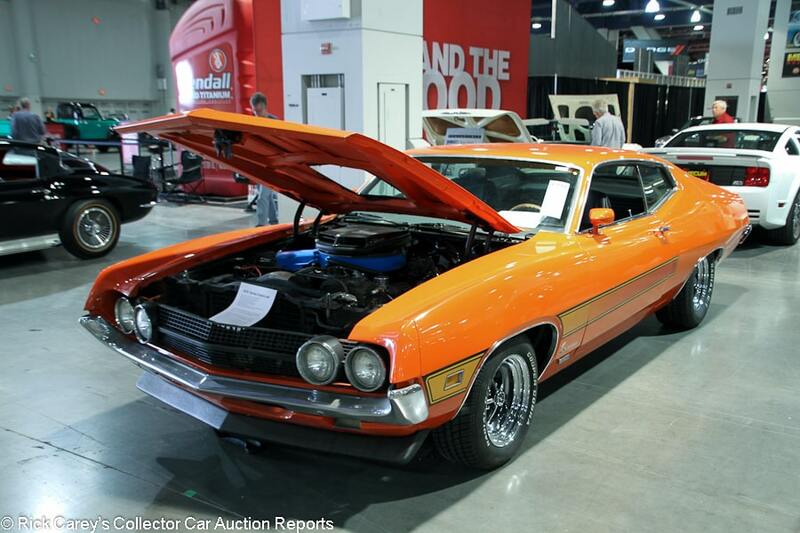 Lot # F159 1970 Ford Torino Cobra SportsRoof; S/N 0R38J150231; Calypso Coral, Black Hood/Black vinyl; Cosmetic restoration, 3- condition; Not sold at Hammer bid of $30,000. With Reserve. – 429/375hp, automatic, Cooper Cobra tires, shaker hood, factory air conditioning (not functional), bucket seats, console, floor shift, woodgrain steering wheel, factory radio, custom upholstery. – Marti Report documented. Rebuilt engine. A bit grimy underneath but not terrible. Unrestored but tidy underbody. Good older paint. The original windshield and wipers are on the rough side. Lightly scratched and pitted window frames. Good upholstery and carpets but the dash is a bit rough. A desirable Torino Cobra that really deserves more thorough restoration work than this. – What turned the bidders off on this Torino Cobra is a mystery. It is worth twice as much, even with the sketchy restoration. Lot # S62 1978 International (IHC) Scout II Traveltop Utility 4×4; S/N H0062HGD44856; Red, White hardtop/Black vinyl; Truck restoration, 2- condition; Hammered Sold at $35,000 plus commission of 10.00%; Final Price $38,500. With Reserve. – 345/168hp V8, automatic, Mud-Terrain T/A tires, roof rack, power steering, power brakes, floor shift, 4WD, Alpine stereo, modern aluminum radiator. – A relatively rare later Scout. Very clean underneath with rebuilt engine, but it’s leaking a bit of oil. Good recent paint. Uneven gaps. Very good restored interior. A truck quality body-off restoration but nothing major to pick on, just a sound, usable, rugged SUV. – This is FJ money, continuing the progression of Scouts, Blazers and Broncos into FJ-territory. 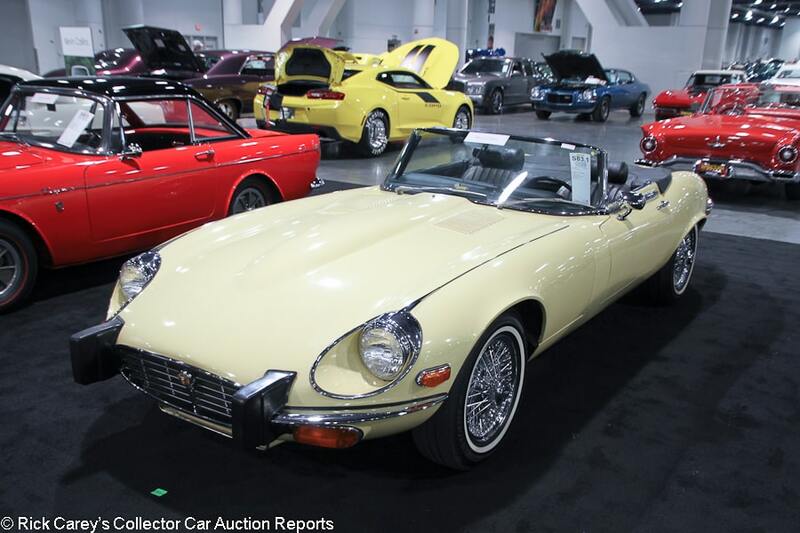 Lot # S83.1 1974 Jaguar XKE SIII V12 Roadster; S/N UE1S25920BW; Pale Primrose/Black; Black top; Unrestored original, 2- condition; Hammered Sold at $84,000 plus commission of 10.00%; Final Price $92,400. With Reserve. – Centerlock wire wheels, narrow whitewalls, boot cover, console, dash clock, factory air conditioning. – From the Kevin Collins collection. Handsome original paint with only a few chips at the back of the bonnet and doors. Some body filler on the right rear quarter. Well-kept original interior with only light wear to the seats and switchgear. Tidy underneath. Showing 14,280 believable miles. A solid, low mile unrestored final year E-Type. – Bid to $100,000 at Mecum Indy last year then not sold at a hammer bid of $80,000 in Harrisburg a few months ago. It can be hard to sell an E-Type with an automatic anywhere, even a late Series III car, and although a car this well preserved arguably deserves more than the winning bid, the seller understandably decided it was good enough to let the car go. 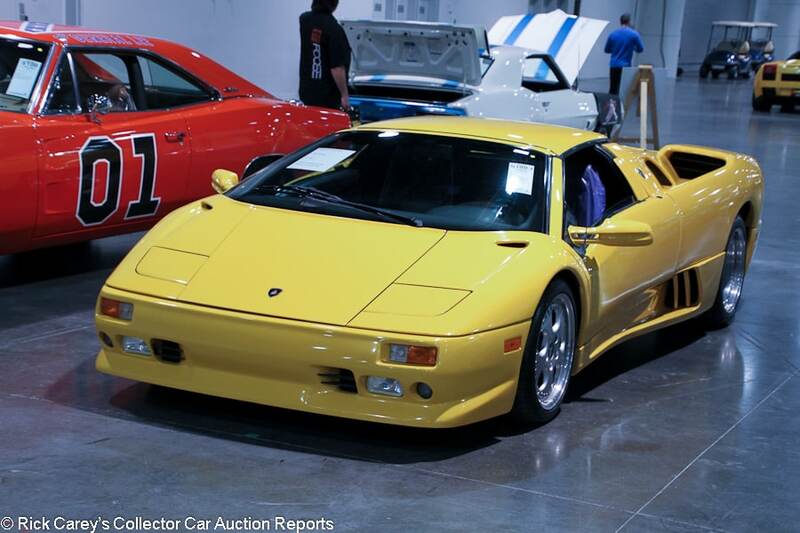 Lot # S100.1 1997 Lamborghini Diablo VT Roadster; S/N ZA9RU37B8VLA12691; Yellow/Black leather piped in Yellow; Unrestored original, 2 condition; Not sold at Hammer bid of $165,000. With Reserve. – 5707/485hp, 5-speed, modular wheels, Michelin Pilot Sport tires, Brembo brakes, removable roof, Alpine CD stereo, power windows, air conditioning, dash clock. – Clear bra on the nose. Very good original paint with no blemishes. Some wear on the seats and transmission tunnel that is more or less commensurate with the 32,365 miles. A lightly used Diablo VT, the first Lambo supercar with all-wheel drive. 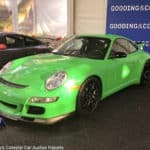 – This car had stiff competition among other modern exotics crossing the block in Vegas on Saturday. The reported high bid is light, and holding out for more is justified but Diablo VTs have never struck a resounding chord with collectors. 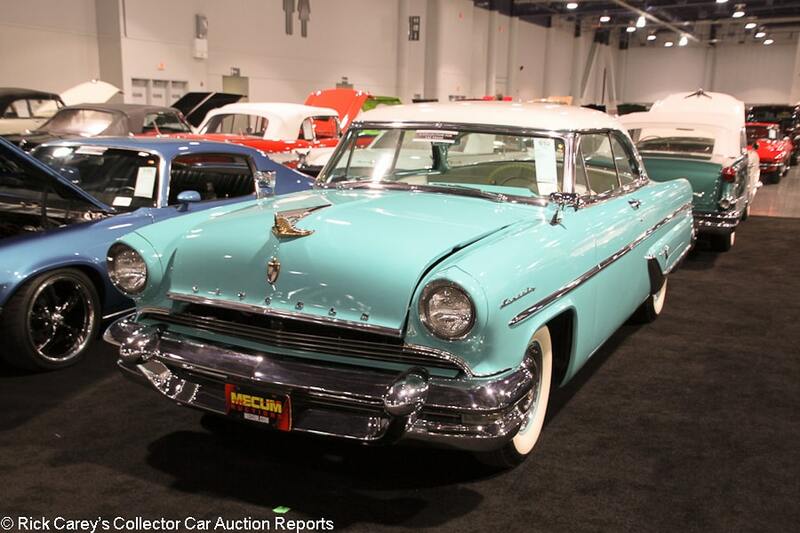 Lot # S52 1955 Lincoln Capri 2-Dr. Hardtop; S/N 55LA5681H; Taos Turquoise, White Roof/Turquoise, White vinyl; Visually maintained, largely original, 3+ condition; Hammered Sold at $27,500 plus commission of 10.00%; Final Price $30,250. With Reserve. – 341/225hp, automatic, wheel covers, whitewalls, fender skirts, power brakes, power windows, pushbutton radio, dealer-installed underdash ventilation system, dual mirrors, power seat, curb feelers. – Unrestored but tidy engine bay and underbody. Good older paint and original chrome. Several large scratches on the right side of the body. Big dent in the driver’s door. Cracks in the steering wheel rim. Very good interior with only light wear. A basic and unremarkable but honest and handsome old Lincoln. 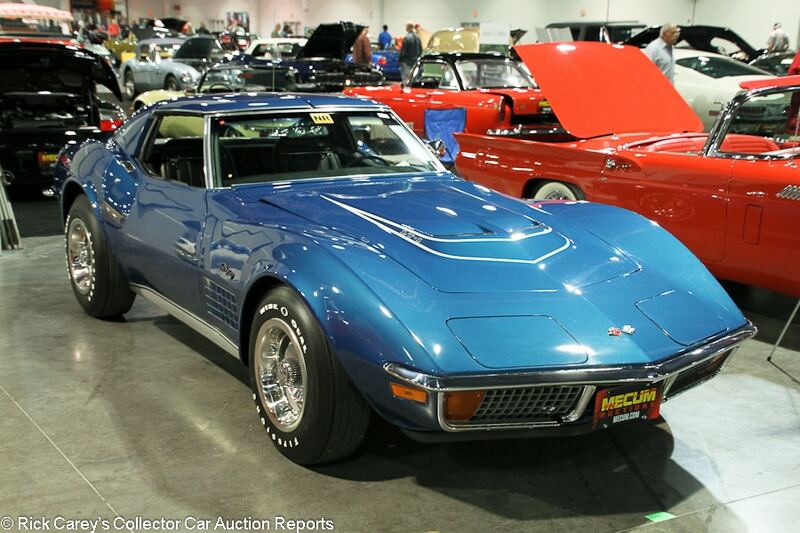 – Sold at Barrett-Jackson Las Vegas in 2012 for $38,500. Keep in mind that this is a Lincoln for less than the price of a Fairlane hardtop in comparable condition with comparable equipment. That’s how collectors value them relative to each other, but the Capri represents excellent value for the money. 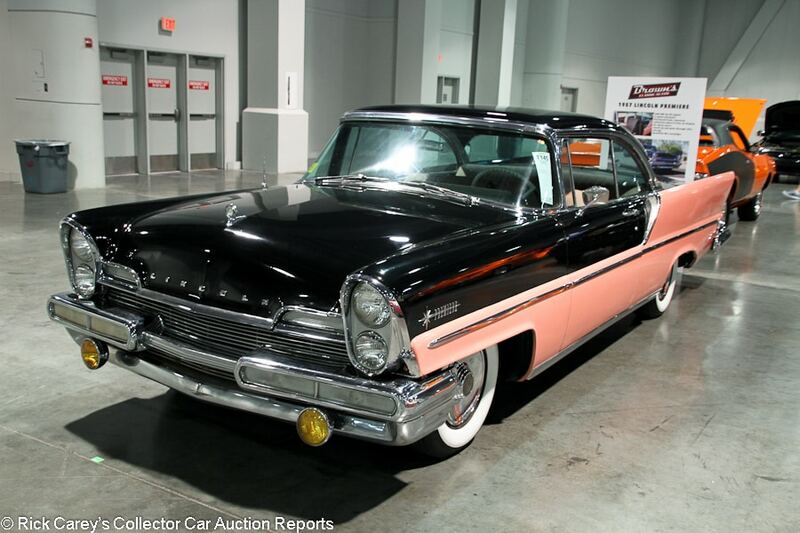 Lot # T145 1957 Lincoln Premiere 2-Dr. Hardtop; S/N 57WA6249L; Black, Pink/Black vinyl, Light Pink cloth; Unrestored original, 4+ condition; Not sold at Hammer bid of $15,000. With Reserve. – Wheel covers, whitewalls, hood ornament, pushbutton radio, dash clock. – Dull original paint with plenty of chips and scratches. Worn underneath. Paint coming off the steel wheels. Rough interior with several bits missing as well as dull gauges and dash. Represented as a museum display for many years but no other history present, so it will likely need some sorting. A solid restoration candidate, but it’s fairly rough. – Rerun Saturday as S245 and reported bid to $18,000 but not sold. It may be original but it also is tired and neglected with many needs. It should have been No Reserve and moved on. 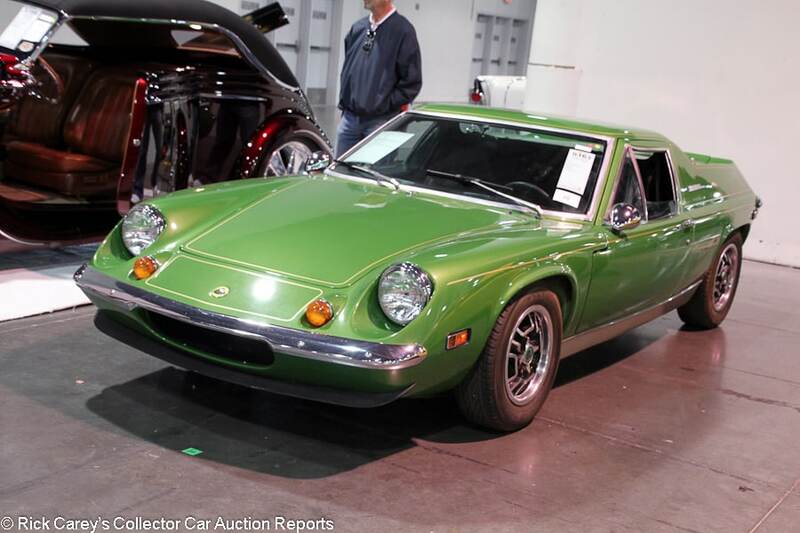 Lot # S163 1974 Lotus Europa Special Coupe; S/N 3394R; Green, Gold/Black; Older restoration, 2- condition; Not sold at Hammer bid of $22,500. With Reserve. – Yokohama tires, dual mirrors, wood dash and shift knob, power windows, leather-wrapped steering wheel, Alpine CD stereo with Sanyo speakers in the doors. – Tidy frame with no visible rust. Good paint with none of the usual stress cracks common on an old Lotus. Lightly scratched bumpers. Tidy engine bay. The interior is mostly good but there is the usual cracking on the wood dash and a piece from the top of the transmission tunnel is missing. A Europa Special that is about as pretty as one of these cars can get, even though they look like something of a mid-engine El Camino. It’s not perfect, but it doesn’t appear to have any of the major needs that an old Lotus can have. – The Europa was one of the very first road cars to embrace the mid-engine layout that Lotus helped pioneer in racing, but at a little over 42 inches tall it would have been easy to miss this one sandwiched in between the Lincolns and Cadillacs at Mecum Las Vegas. This car was sold at Mecum’s Chicago auction in 2015 for $27,500 all-in and the reported high bid here was on the light side for such a solid car, but still worth considering. 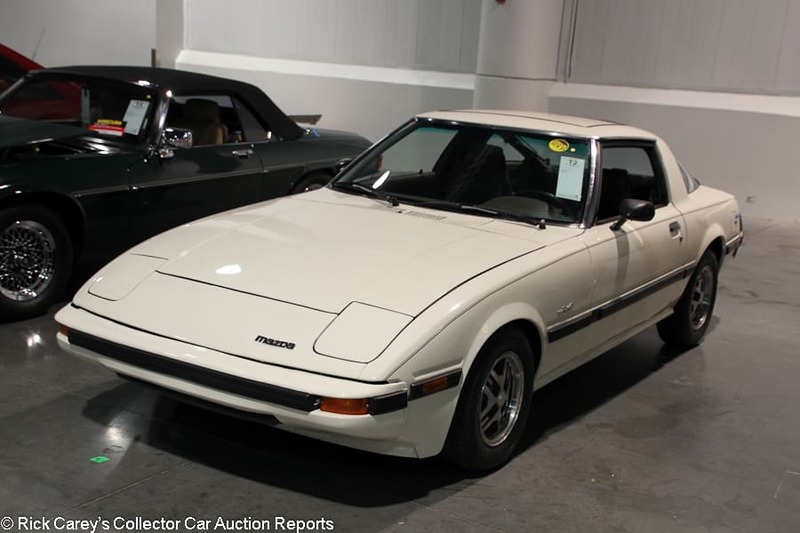 Lot # T2 1981 Mazda RX-7 Coupe; S/N JM1FB3319B0504642; White/Brown vinyl, cloth; Visually maintained, largely original, 3- condition; Hammered Sold at $3,500 plus commission of 14.29%; Final Price $4,000. With Reserve. – Sunroof, automatic, console, aftermarket cassette stereo. – Decent older single repaint. Otherwise all original and showing 98,583 miles. The interior is a bit rough and worn but it corresponds to the age and mileage. The wheels are dirty and the engine bay and underbody are worn. A used car. – Not worth enough to put much work into, too rough to be proud of and not very exciting with the automatic. It might be best put to use as a parts car to keep other early RX7s on the road, and was bought for little more than parts car money. It was bid to $3,600 at the Leake Dallas auction in November 2016, then to $5,000 at Mecum’s sale in Los Angeles in February of this year. The seller finally got fed up with giving it transporter rides and let it go. 24 Hours of LeMons may be in its future. 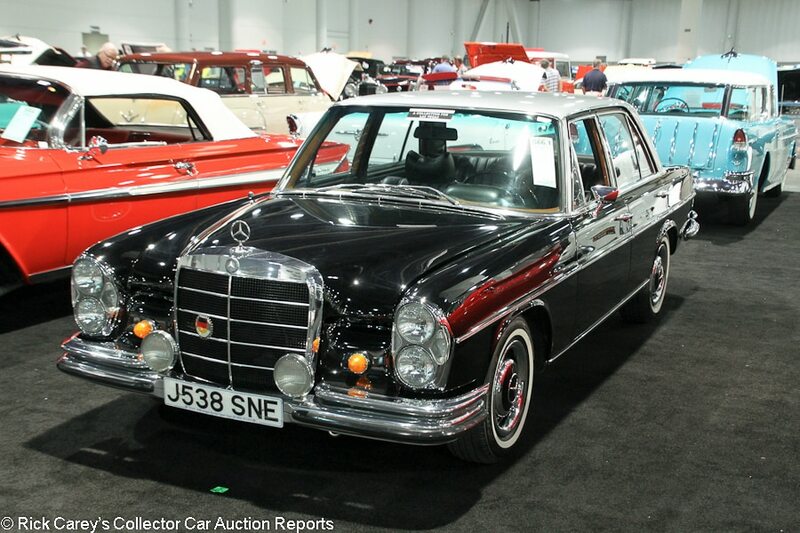 Lot # S66.1 1966 Mercedes-Benz 250S 4-Dr. Sedan; S/N 10801212011135; Black, Silver roof/Black; Visually maintained, largely original, 3 condition; Hammered Sold at $12,500 plus commission of 10.00%; Final Price $13,750. With Reserve. – 2496/146hp six with two carbs, automatic, hub caps and trim rings, narrow whitewalls, factory air conditioning, wood dash, power windows, later Pioneer stereo, fog lights. – New chrome around the headlight bezels but the rest of it is dull and lightly scratched. Decent possibly original paint with lots of light detail scratches and some cracks in the hood. A few cracks in the wood trim on the dash top. The window glass has pretty bad track scratches. The rest of the interior is pretty good and mostly original. Lots of scratches around the window frame. 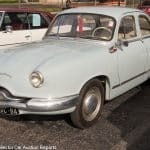 A mostly solid car that would benefit from some light but thorough restoration work. – Not sold at a $14,000 high bid at Mecum Monterey in 2015, then sold for $16,500 at Mecum Anaheim the same year. Fairly consistent results. The car still hasn’t gotten the attention it needs to make it a really good car, but these sedans aren’t really worth enough to put a lot of money into, just something to amaze the rest of the owner’s golf foursome at the country club. The floaty suspension and squashy seats do not inspire confidence. 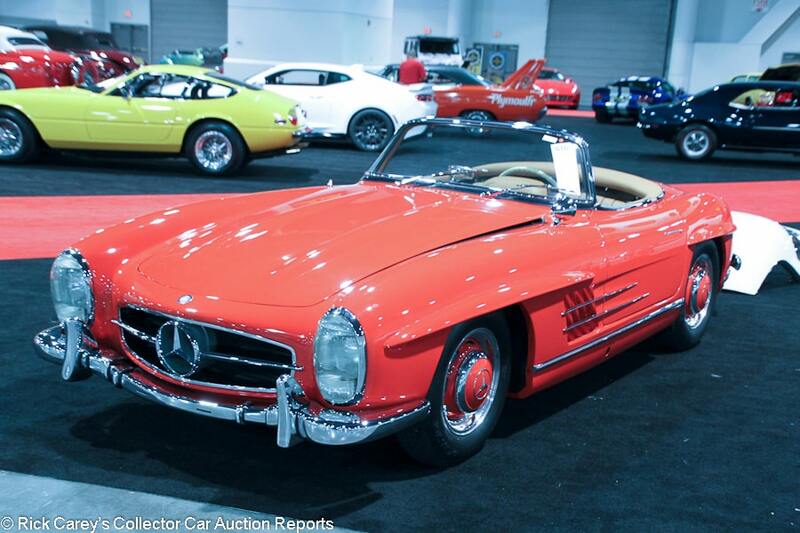 Lot # S108 1958 Mercedes-Benz 300SL Roadster; S/N 19804285000295; Fire Engine Red, White hardtop/Saddle leather; Tan top; Older restoration, 2 condition; Not sold at Hammer bid of $1,000,000. With Reserve. – Hub caps, Excelsior Racing tires, hardtop, dash clock, Becker Mexico radio, Euro headlights. – Represented as the matching numbers engine, chassis, body, engine, transmission and differential. Delivered to Venezuela and remained there until 2014. Everything has been replaced or redone, but apparently not all at once. Nevertheless, it presents like a fresh gorgeous restoration. – Let’s see … this is a car exported from Venezuela in 2014 as the Bolivarian Revolution was devolving into the Bolivarian/Maduro dictatorship. Touch this car with a 10′ pole? No way. 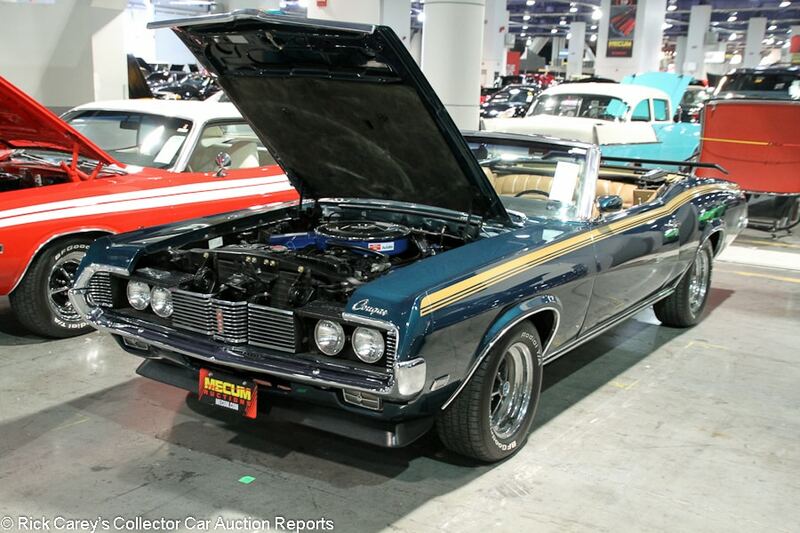 Lot # F71 1969 Mercury Cougar XR-7 Convertible; S/N 9F94H510213; Green, Gold/Tan vinyl; Tan vinyl top; Older restoration, 2- condition; Not sold at Hammer bid of $25,000. With Reserve. – 351/250hp upgraded to a 4-barrel, automatic, hood scoop, spoilers, Radial T/A tires, power top, power steering, power brakes, bucket seats, floor shift, console, power windows, power top, dash clock, factory 8-track stereo, factory air conditioning, Elite Marti report. – Very good, cleaned up engine bay with a few original bits and some heat rash on the headers. A few unfortunate scratches on the right front fender but mostly very good paint and chrome. Good interior with newer seats and carpets, but the rest is original and sound. Older restored underneath. A loaded and attractive XR-7, restored to reasonably high standards but shortcuts were taken that are not hard to spot. – Reported sold at Mecum’s March Kansas City auction for $27,500. 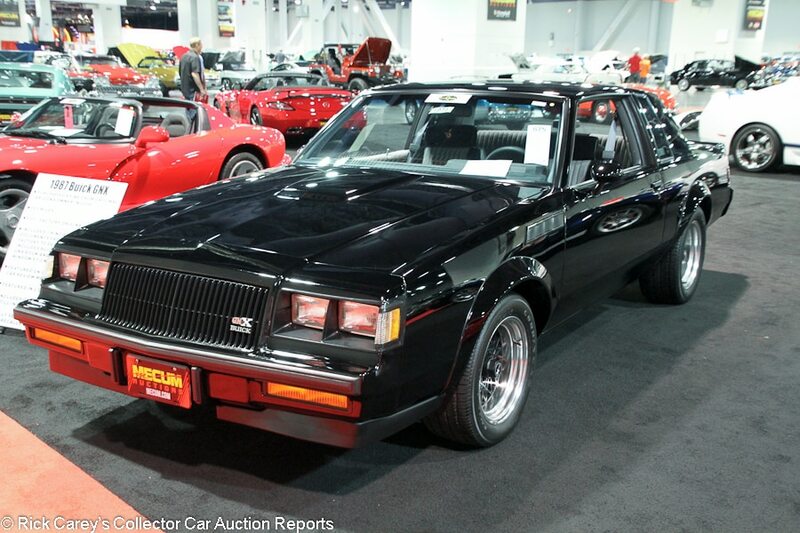 This is a fair if not generous offer for this XR-7 that would have seen it move on for the same all-in money but left the seller several thousand dollars out of pocket. It could have been let go at the reported high bid, but the seller wouldn’t have to keep toting it from auction to auction and paying entry fees. Don’t be surprised if it’s on the 2018 Kissimmee docket. Lot # F68 1958 Metropolitan 1500 Series III Convertible; S/N E41373; Berkshire Green, Frost White/Black, White vinyl; Older restoration, 2- condition; Hammered Sold at $14,000 plus commission of 10.00%; Final Price $15,400. With Reserve. – Hub caps, narrow whitewalls, rear-mounted spare, hood ornament. – Very good paint aside from a few chips at the back edge of the driver’s door. Slightly uneven gaps. Light road wear underneath. Fully restored and attractive, but not done yesterday. – Somebody actually paid $74,250 for a Metropolitan at RM Hershey back in October, but that appears to have been a fluke and this result is closer to reality. This car sold at Barrett-Jackson Orange County in 2010 for $18,700, and this result is modest but fair. 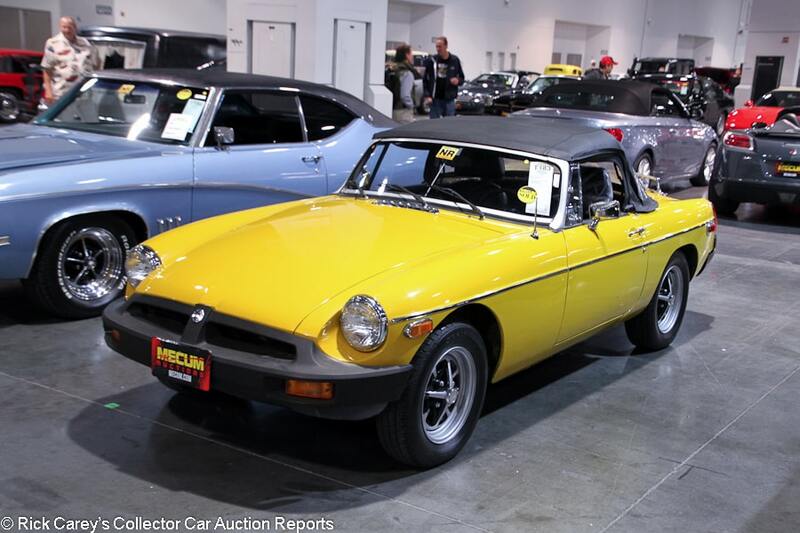 Lot # T183 1980 MG MGB Mk IV Roadster; S/N GVVDJ2AG505217; Yellow/Black vinyl; Black vinyl top; Visually maintained, largely original, 3+ condition; Hammered Sold at $4,500 plus commission of 11.11%; Final Price $5,000. With Reserve. – Dunlop tires, luggage rack, Kenwood CD stereo. – Driver quality repaint with several chips on the driver’s door and left rear fender. Some overspray in the wheel wells. Very good, tight fitting original top. Light oxidation but nothing bad underneath. Very good original interior. A driver, but as good as you can expect from a rubber bumper MGB. It has benefitted from life in a dry climate. – Rubber bumper Bs are one of the most affordable ways to get into a ‘proper’ classic sports car, but even so this was very little money for a fundamentally good car, leaving the new owner with plenty of money left for spare parts. It was reported sold for the same price at Mecum’s Denver auction four months ago. Lot # F249 1956 Oldsmobile 88 2-Dr. Sedan; S/N 567C18899; Beige, Brown/Beige vinyl, cloth; Unrestored original, 4- condition; Hammered Sold at $8,000 plus commission of 10.00%; Final Price $8,800. With Reserve. – Hub caps, blackwall tires, dash clock. – In storage since 1978 and hasn’t been driven because of a transmission seal leak. Sound but dull original paint with a handful of deep scratches. The underbody is dirty but there is no serious rust. Sound, older interior. A straightforward project car. Nothing special, but would make a neat winter project for someone on a budget. – Unsold on the block at the same bid, closed later and wisely accepted by the seller. 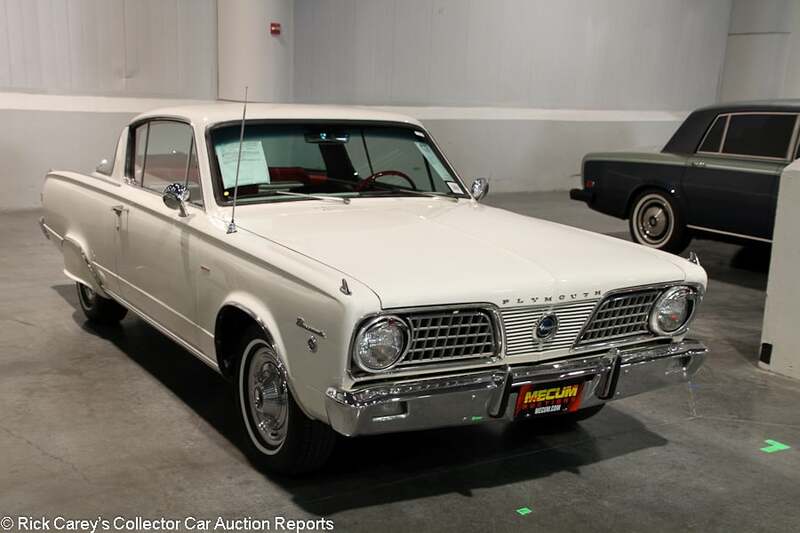 Lot # F78 1966 Plymouth Barracuda Fastback; S/N BP29D62519500; White/White, Red vinyl; Enthusiast restoration, 3 condition; Hammered Sold at $18,000 plus commission of 10.00%; Final Price $19,800. With Reserve. – 273/235hp, automatic, wheel covers, narrow whitewalls, fender skirts, dual mirrors, bucket seats, console, floor shift, later cassette stereo. – Dull, tired original chrome and brightwork. Good older paint. The driver’s door sticks out a bit. Some of the stitching in the driver’s seat is coming loose and there are a few scuffs on the white parts of the seats, but the interior is mostly good. Fuel spillage running down from the filler cap has damaged the paint. A basic car, but a fairly attractive one. – Sold at Barrett-Jackson Las Vegas in 2010 for $19,800. Some parts of the collector car market have remained dead flat over the course of this decade even as others have soared. This is one of them. 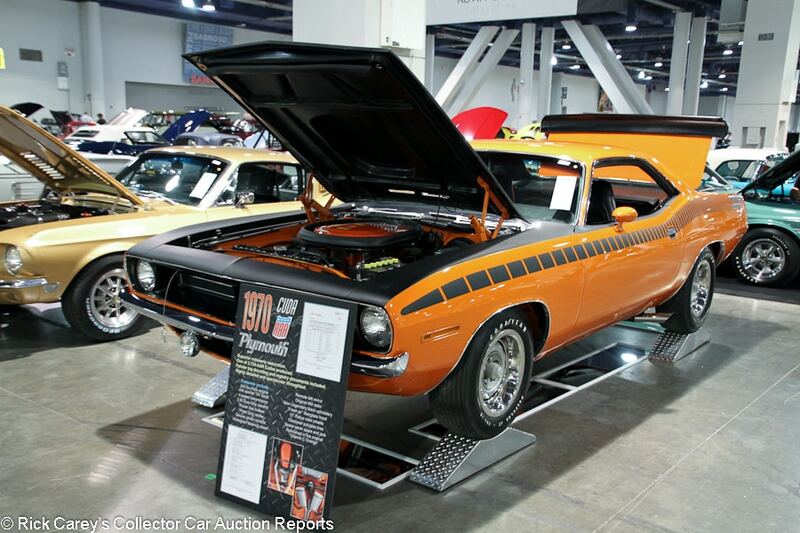 Lot # S121.1 1970 Plymouth ‘Cuda AAR 2-Dr. Hardtop; S/N BS23J0B277828; Vitamin C Orange, Black/Black vinyl; Recent restoration, 2 condition; Hammered Sold at $83,000 plus commission of 10.00%; Final Price $91,300. With Reserve. – 340/290hp, Six Barrel, 4-speed, Polyglas GT tires, hood scoop, rear spoiler, 3.90 Sure Grip, power brakes, remote driver’s mirror, Hurst pistol grip shifter, console, factory radio, hood pins. – Very clean, fresh engine bay. Very good paint and brightwork. Very good interior. Freshly done top to bottom and to high standards. A very good and believed genuine AAR backed by its VIN with the appropriate engine code. – Sold by Mecum at Harrisburg in 2014 for $54,000, then by Russo and Steele at Monterey in August of this year for $46,200. This is a stunning result based upon auction history (and there’s really been no time since August ’til now to make it much better than its 2- condition then.) What changed? Time and Place is about it and this is a bright and shining result that fully values this high quality 4-speed AAR. 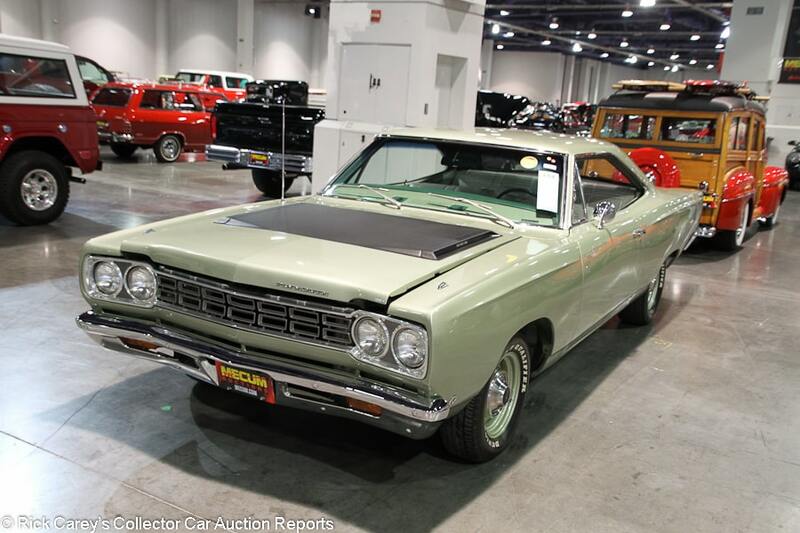 Lot # F64 1968 Plymouth Road Runner 2-Dr. Hardtop; S/N RM23HG276160; Mist Green, Black/Pearl White vinyl; Older restoration, 2- condition; Hammered Sold at $36,000 plus commission of 10.00%; Final Price $39,600. With Reserve. – 383/335hp, automatic, hub caps, Dunlop G/T Qualifier tires, limited slip, power steering, power brakes, bench seat, column shift, factory stereo. – Very good paint other than a handful of tiny chips on the hood and a long, light scratch on the driver’s door. Excellent fully restored interior. Nearly spotless underneath. Slightly uneven door gaps. Meticulously restored a while ago and still has a lot of eyeball in these unusual colors. – A desirable car particularly with the power steering and brakes which many if not most Road Runners don’t have having been bought by young guys who substituted Armstrong steering for the money not in their bank accounts. It is a sound value at this price and should please its new owner. Lot # S115 1970 Plymouth Road Runner Superbird 2-Dr. Hardtop; S/N RM23R0A172595; Tor Red, Black vinyl roof/Black vinyl; Unrestored original, 3 condition; Not sold at Hammer bid of $230,000. With Reserve. – Polyglas GT tires, Hemi engine, automatic, console, factory radio, power steering, power brakes, Performance Axle package, hood pins. – The original paint is faded but sound, although the nose has been resprayed. Good, tight fitting roof vinyl. Unrestored but tidy engine bay. The unrestored interior is spectacular and hardly shows any age. 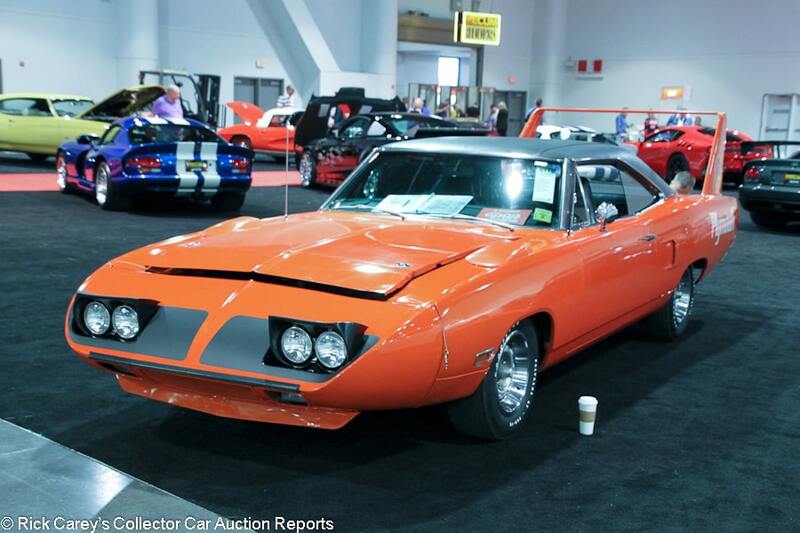 Any Hemi Superbird is something special, but this one is pretty much all original, which is something else. – Not sold at a $300,000 high bid at Mecum Kissimmee 2017. Charger Daytonas are popular, Road Runner Superbirds are everywhere. 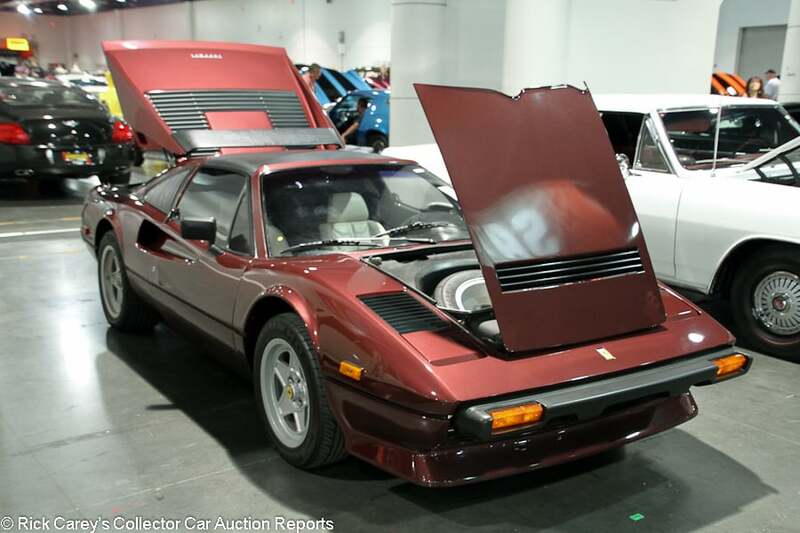 Supply and demand mean something but the Las Vegas bidders missed on this car which should have brought more even if not what the reported Kissimmee bid was. Lot # S87.1 1963 Plymouth Savoy Max Wedge 2-Dr. Sedan; S/N 3131167605; Medium Metallic Blue/Blue vinyl, cloth; Visually maintained, largely original, 2+ condition; Not sold at Hammer bid of $85,000. With Reserve. – 426/415hp Max Wedge, automatic, Hub caps, Goodyear tires, bench seat, pushbutton automatic, factory radio, rear seat speaker, 3.91 Sure Grip. – Fully documented and featured in several magazines. Very rare Savoy Max Wedge. Stored from 1967-96. Fantastic unrestored, highly detailed engine bay. The paint is represented as original, which seems hard to believe but is impossible to contest. The underbody is spotless, as is the interior. The car presents like a fresh restoration but it’s represented as a survivor. Most Max Wedges have a Dodge badge, so this car is fairly special. 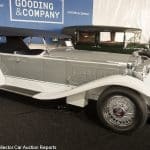 – Sold for $44,000 at Mecum Monterey fifteen months ago, the reported high bid here is appropriate for a car not many collectors know of or care about. And it has a radio! Cruisin’ in this in the Sixties would have been something of a dream ride, not to mention cruisin’ in it in the second decade of the 21st century. The consignor’s decision to keep it is difficult to understand, if there was money at or close to the reported high bid. 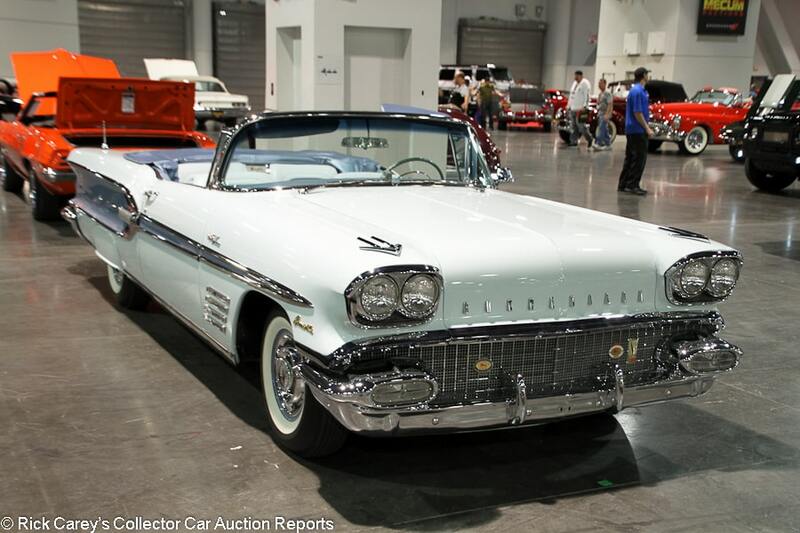 Lot # S55 1958 Pontiac Bonneville Convertible; S/N C558H1257; Cashmere Blue, Deauville Blue spears/Blue, Light Blue leather; White top; Concours restoration, 1- condition; Hammered Sold at $160,000 plus commission of 10.00%; Final Price $176,000. With Reserve. – 370/330hp, Tri-Power, automatic, wheel covers, whitewalls, fender skirts, boot cover, power steering, power brakes, power top, bucket seats, column shift, factory radio, rear seat speaker. – Represented as matching numbers. AACA Senior National and Grand National first prize wins. Restored in 2008. Excellent paint and brightwork. Even gaps. Light wrinkling to the seats but mostly excellent interior. Every bit the show car it’s represented as, – Sold for $143,000 at Mecum Monterey earlier this year and brought even more here today, a rare, quality, high performance Pontiac with a fastidious and attentive restoration such that its result here cannot be faulted. It’s strong money for a strong car. 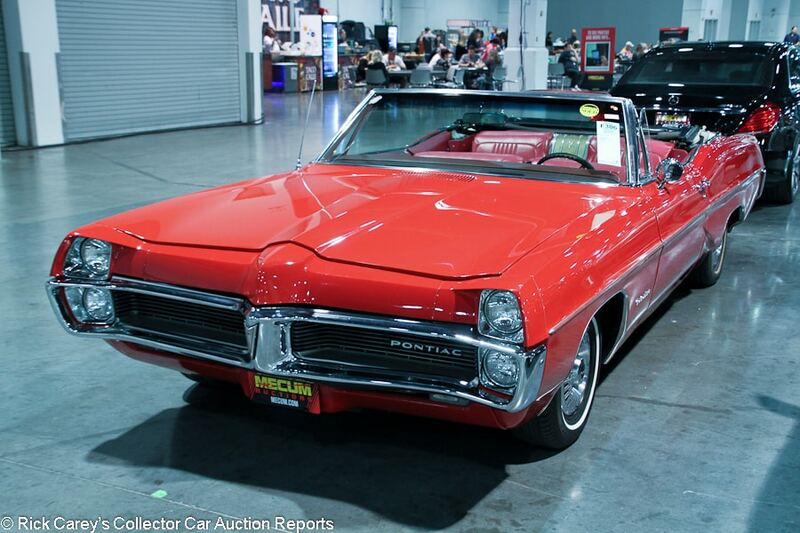 Lot # F306 1967 Pontiac Catalina Convertible; S/N 252677P187929; Red/Red vinyl; White vinyl top; Unrestored original, 3 condition; Hammered Sold at $14,500 plus commission of 10.00%; Final Price $15,950. With Reserve. – 400/290hp, automatic, wheel covers, narrow whitewalls, power top, power steering, bench seat, column shift, factory radio, rear seat speaker. – Decent old repaint with several chips on the hood as well as scratches on the right front fender. Good newer top. Faded and worn original interior. The seats are actually intact and don’t show much wear, but the car looks like it has seen a lot of sun because the upholstery is faded to more of a pink than red. Unrestored but dry and tidy underneath. An unrestored driver. – Rerun of T115, no sale at $13,000. The sun damage that has faded the upholstery has also baked the plasticizers out of it, likely leaving it crisp and fragile, the downside of a dry western climate that preserves the metal. Still, upholstery is cheaper than new fenders and this is a reasonably price low impact project car. Lot # S44.1 1968 Pontiac Firebird 400 Convertible; S/N 223378L101564; Turquoise, Black vinyl roof/Turquoise vinyl; Recent restoration, 2- condition; Not sold at Hammer bid of $34,000. With Reserve. – 400/335hp, automatic, Rally II wheels, Radial T/A tires, console, floor shift, factory radio, power steering, power brakes, factory air conditioning, PHS documents. – Very good paint and chrome. Factory gaps. Tidy restored engine bay. The console is a bit wavy but the interior is mostly very good. Restored and only very lightly used since. – A fair offer, especially considering it sold for $33,000 at Mecum Houston seven months ago. Firebirds are frothy, but mostly for Trans Ams and especially Bandits. This 400 looks mundane next to a Trans Am and the bid reflects that. 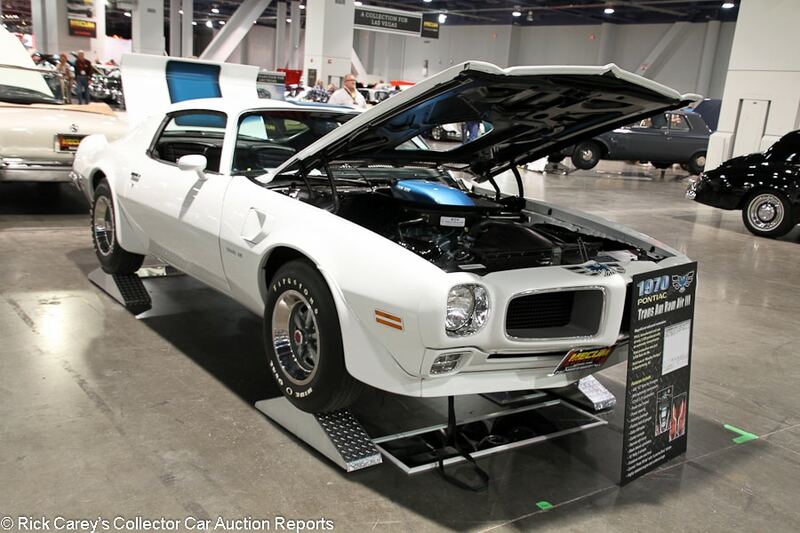 Lot # S106.1 1970 Pontiac Firebird Trans Am Coupe; S/N 228870N111754; Polar White, Lucerne Blue/Black vinyl; Recent restoration, 2+ condition; Hammered Sold at $47,000 plus commission of 10.00%; Final Price $51,700. With Reserve. – 400/345hp, automatic, Rally II wheels, Firestone Wide Oval tires, 3.31 Positraction, power steering, power brakes, handling package, remote driver’s mirror, AM radio, bucket seats, floor shift, console. – Spotless restored engine bay and underbody. Very good paint, chrome and interior. Fresh and nothing to pick on. It’s just a Ram Air III with an auto, but it’s still a genuine TA and it’s gorgeous. – Sold for $35,100 at Mecum Indy in 2014 and likely fleshed out with this marvelous restoration since then, the buyer paid cents on the dollar for the restoration’s cost and got a superior car at a shallow price, a good value by any standard. 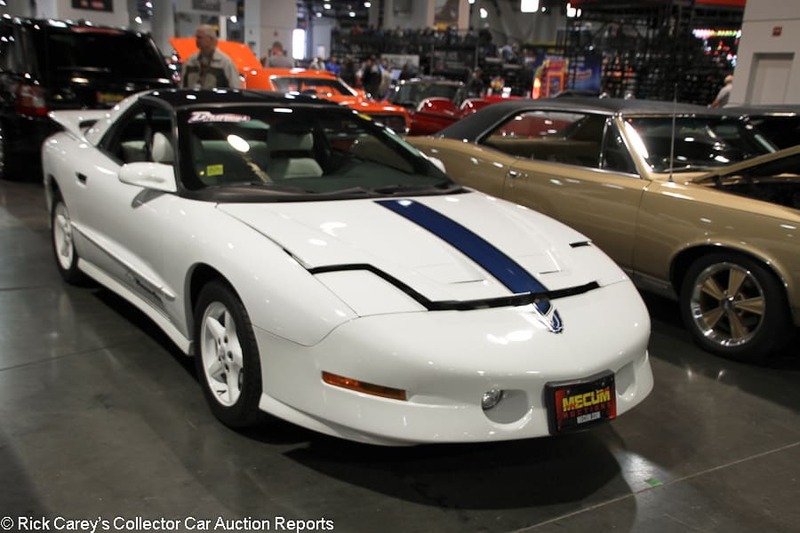 Lot # F307 1994 Pontiac Firebird Trans Am 25th Anniversary Coupe; S/N 2G2FV22P4R2234224; White, Blue/White leather; Unrestored original, 2- condition; Hammered Sold at $13,500 plus commission of 10.00%; Final Price $14,850. With Reserve. – 350/275hp, automatic, glass T-Tops, white wheels, Potenza tires, factory cassette stereo. – A handful of chips and scratches on the nose. Those, the 24,584 miles and the light wear to the driver’s seat are the only things keeping this from being a like-new 25th anniversary Trans Am. – Rerun of T158, no sale at $13,000 bid. Appropriately discounted for the light cosmetic flaws and auto transmission. 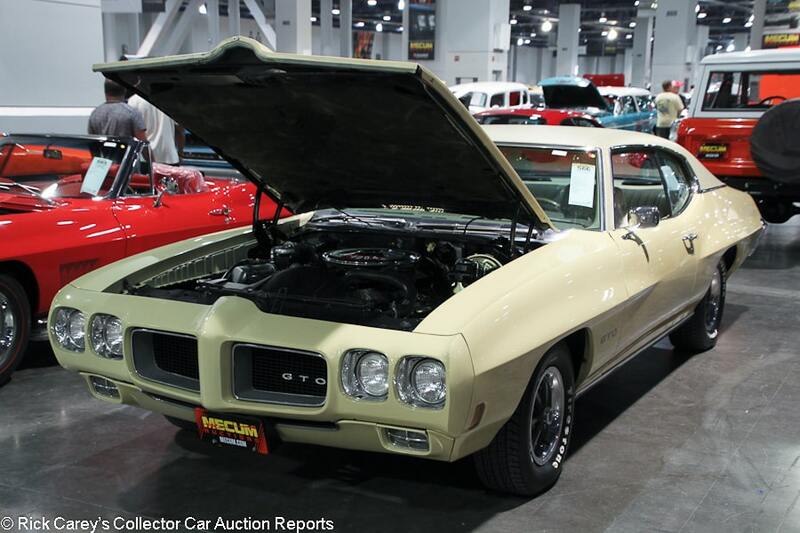 Lot # S66 1970 Pontiac GTO 2-Dr. Hardtop; S/N 242370Z102652; Sierra Yellow, Beige vinyl roof/Beige vinyl; Older restoration, 2- condition; Not sold at Hammer bid of $24,500. With Reserve. – 400/350hp, automatic, Rally II wheels, Firehawk tires, power brakes, factory air conditioning, dash clock, newer radio. – Represented as a Pontiac special equipment order. West coast car. Very good, fully restored engine bay and underbody. The front bumper isn’t on straight. Very good paint. Light pitting on the side mirror. Very good original interior. Restored in these original and unusual but handsome colors. Not perfect, but a car to be proud of. – An ordinary ’70 GTO but one that has had serious attention that amounted to more than this parsimonious bid amount. The bid was reasonable for the bidder, but reasonably declined by the seller. It’s a seller’s decision that brings up the usual question: how many times is it worth hauling this car from auction to auction looking for the occasion when a $30,000 bidder will show up? 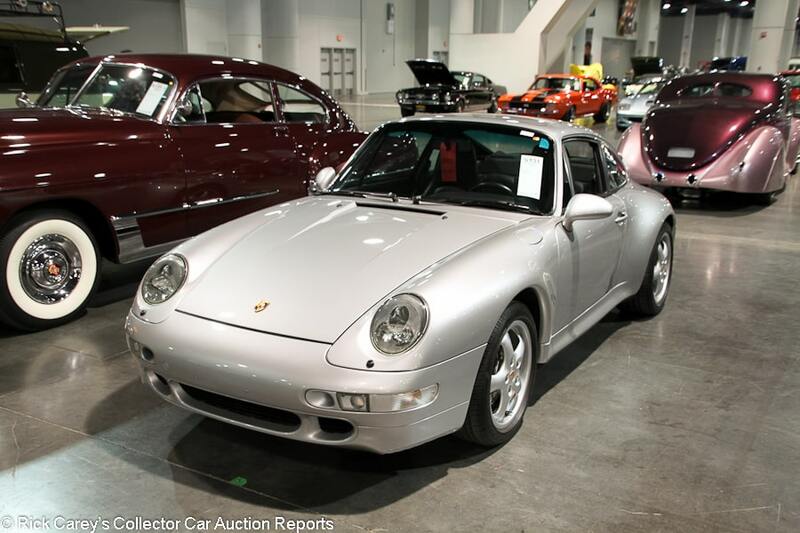 Lot # S131 1997 Porsche 911 Carrera Coupe; S/N WP0AA2996VS322622; Silver/Black leather; Unrestored original, 2- condition; Hammered Sold at $35,000 plus commission of 10.00%; Final Price $38,500. With Reserve. – Cross-drilled rotors, P Zero tires, sunroof, Tiptronic, power windows, air conditioning, factory cassette stereo. – A few light scrapes on the left rear wheel. Large crack in the right headlight, probably from a rock. Very good original paint. Light wear to the seats that is commensurate with the 46,339 miles showing. A lightly used late 993. Nothing particularly special but a seemingly solid car. – A fairly light result for a 993, even accounting for the Tiptronic. Then again, the car was not represented with any kind of service history, and that matters to Porsche people even more than most. Lot # F26 1988 Porsche 911 Carrera 3.2 Cabriolet; S/N WP0EB0911JS171731; Cassis Red/Black; Black cloth top; Unrestored original, 3 condition; Hammered Sold at $30,000 plus commission of 10.00%; Final Price $33,000. With Reserve. – Color matched Fuchs wheels, Potenza tires, snorkely brake light, power windows, climate control, Alpine CD stereo. – Showing 128,217 miles, but represented as a California car with lots of recent mechanical servicing. The paint is a bit rough with a big scrape on the left front fender as well as several sizable scratches and chips. The cloth top is fairly tired and paint is chipping off the window frames. The plastic rear window is also very rough. The engine bay is tidy and the underbody shows light road wear. – This is a heavily used driver, but presumably someone has already gotten a lot of the expensive shop bills out of the way, and that makes this price fairly strong price easier to understand. This price would have bought a mint low mile example five years ago, though. 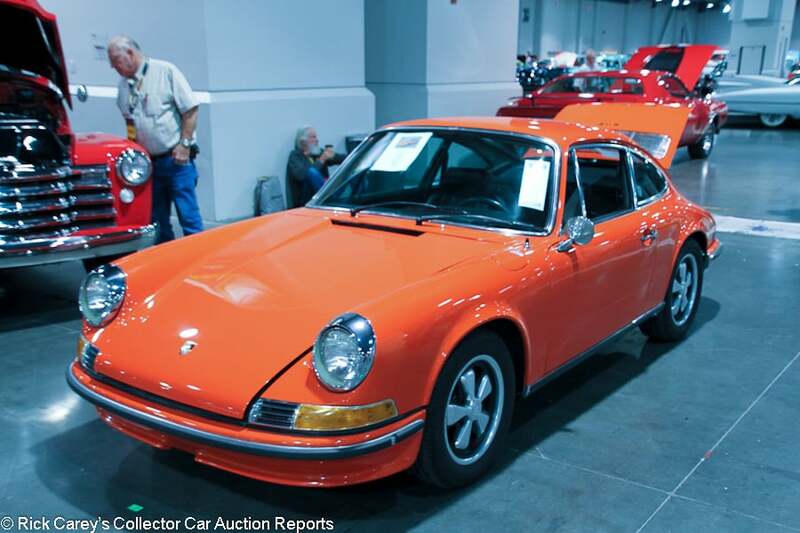 Lot # S159 1970 Porsche 911E Coupe; S/N 9110230688; Tangerine/Black; Visually maintained, largely original, 3+ condition; Not sold at Hammer bid of $45,000. With Reserve. – Fuchs wheels, gold brightwork, Blaupunkt AM/FM radio. – Recent light mechanical service. Good but lightly worn original interior. Scratched up window frames. A piece is missing out of the front bumper rub strip. Good older paint. The engine bay is a bit grimy but maintained. A solid but not perfect midrange E model 911. – The reported high bid is less than project car money. Nearly twice this number would be more realistic. 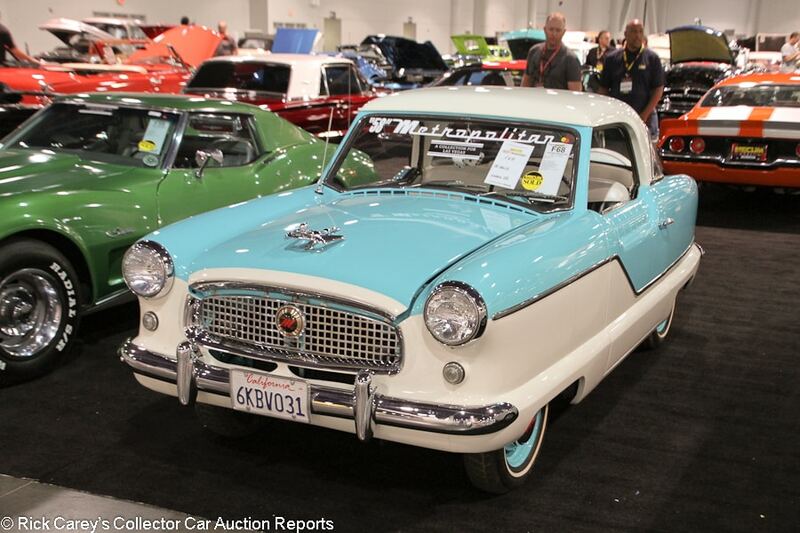 This car brought a declined bid of $65,000 at the Spring Branson auction seven months ago and why the bidders here were so dismissive is unclear although there were several noted instances this week where bidding ended well below reasonable amounts. 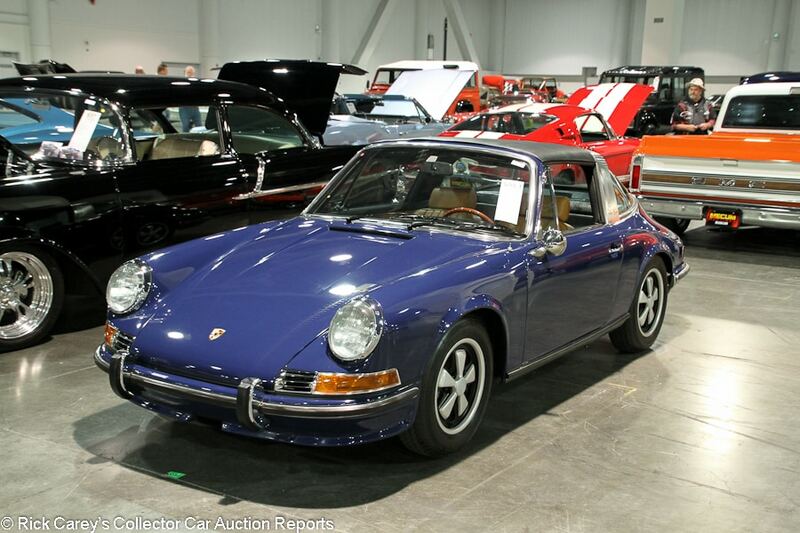 Lot # S55.1 1971 Porsche 911S Targa; S/N 9111310702; Albert Blue, Black roof/Tan leatherette; Recent restoration, 2- condition; Not sold at Hammer bid of $120,000. With Reserve. – 2195/200hp, 5-speed, Fuchs wheels, Vredestein tires, woodrim steering wheel, Blaupunkt stereo, air conditioning, tinted glass, gold brightwork. – Advertised as freshly restored. Fresh, clean and correct engine bay. Good brightwork and paint with some light detail swirls. Some light scratches on the roll hoop. Very good, like new interior. A very good, desirable S Targa restored to high enough standards but it isn’t a show car. – The reported high bid is nearly there, but not quite. After a strong run long wheelbase 911s seem to have entered a zone of uncertainty that has optimal results-seeking sellers and good long term value-seeking buyers somewhat disconnected. With only a couple minutes for the consignor to make a decision it’s understandable why the two sides didn’t come together, although Mecum might have made it work post-block if there was serious money at this bid. 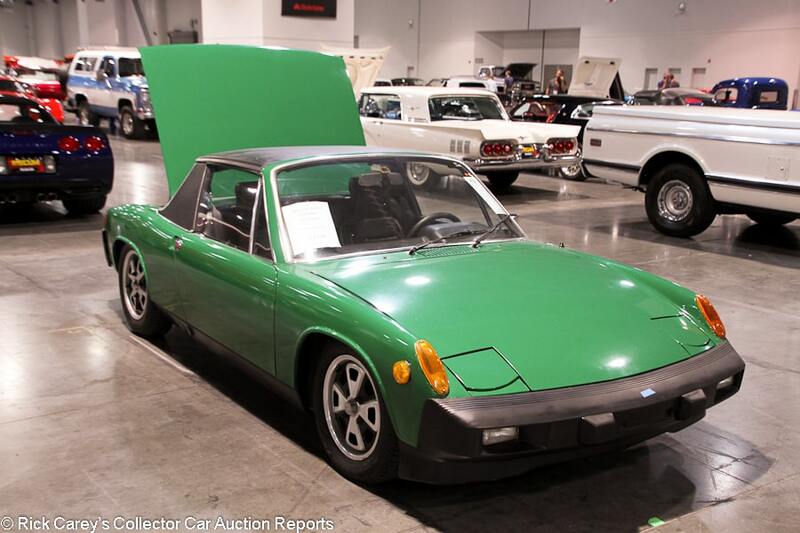 Lot # F34 1975 Porsche 914 1.8 Targa; S/N 4752900122; Forest Green, Black/Black piped in Green; Enthusiast restoration, 3- condition; Hammered Sold at $16,500 plus commission of 10.00%; Final Price $18,150. With Reserve. – Console, aftermarket radio. – Terrible faded old paint with chips and scratches everywhere. The exterior plastic is dull. Decent lightly worn interior. The right headlight door sticks up a bit. The trunk is a bit of a mess with paint flaking off on the floor and loose wires all over the place, the engine bay is a bit dirty. A usable 914, but with the 1.8 engine and this pretty rough condition, you’d feel a little self-conscious driving it. – This one is a bit tough to explain other than attributing it to exuberance from the bidders’ section. 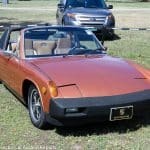 This is a pretty ratty 914, and a number around half this result would have been more realistic to the car’s actual value. 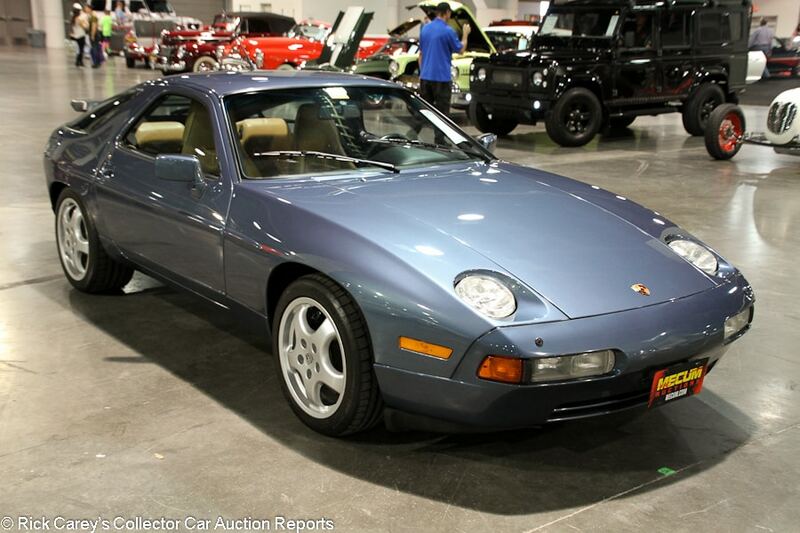 Lot # S52.1 1989 Porsche 928 S4 Coupe; S/N WP0JB0920KS860636; Blue/Tan; Unrestored original, 2- condition; Hammered Sold at $26,000 plus commission of 10.00%; Final Price $28,600. No Reserve. – Pilot Sport tires, rear spoiler, sunroof, power seats, power windows, air conditioning, later Alpine stereo. – Recently serviced. A handful of small chips on the nose and hood but mostly very good original paint. Very good interior with wear to the seats that corresponds with the mileage. Showing 61,037 miles. A used car that, while not perfect, has been well cared for its whole life unlike most 928s. – With greater refinement and a lot more power, the later S4 versions of the 928 are worth considerably more than earlier models, and this car’s good original condition is impressive. Despite going across the block early in the day and at no reserve, it brought a fair price. 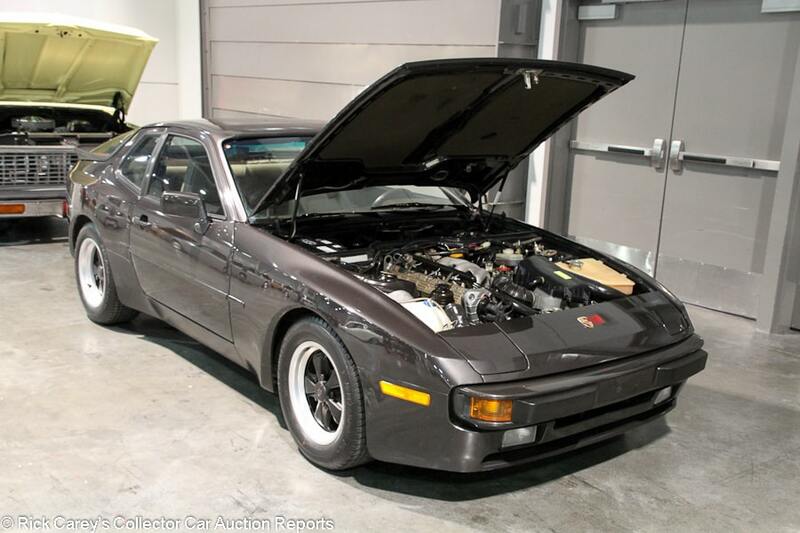 Lot # T68 1985 Porsche 944 Coupe; S/N WP0AA0948FN474622; Charcoal/Gray; Unrestored original, 2- condition; Not sold at Hammer bid of $14,000. With Reserve. – Black Fuchs wheels, Dunlop tires, sunroof, power windows, air conditioning, Blaupunkt cassette stereo, dash clock. – Tidy engine bay. Very good original paint other than a few scratches on the right rear fender. Very good interior other than light wrinkling to the driver’s seat. A solid, well-kept 40,017-mile 944 that’s better than most of the other early ones still on the road. There are no specifics on what maintenance has been done, however, and big service jobs can cost a significant fraction of the car’s total value. – Bid to $15,000 at Mecum Harrisburg in July 2016, then to $16,500 at Auburn Fall a few weeks later. Values for 944s shot way up along with everything else with a Porsche badge over the course of 2015 and, like 911s, 944s have stayed fairly expensive for what they are. This would have been barely a four-figure car only a few years ago. Now, the owner is turning down 14 Grand and isn’t entirely unjustified in doing so when the car is this well kept. Enjoy it for the next two months and see if it can find a more receptive audience in Kissimmee or Scottsdale. 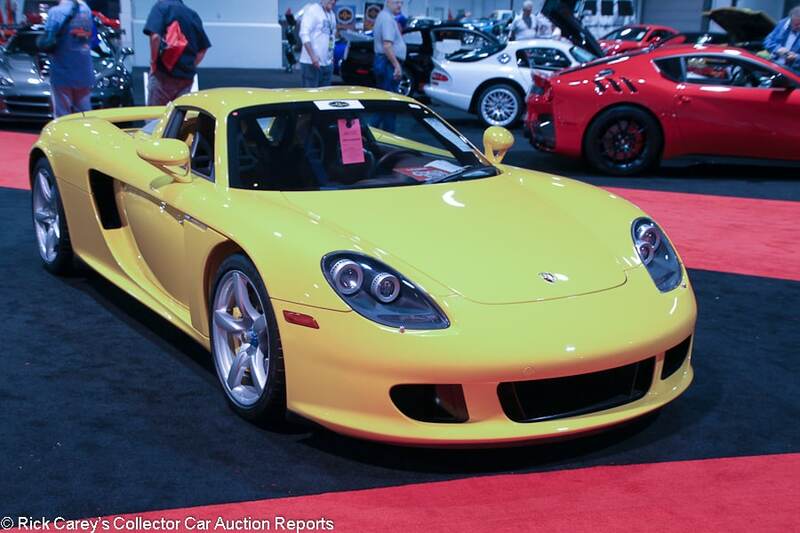 Lot # S75.1 2005 Porsche Carrera GT Coupe; S/N WP0CA29825L001171; Fayence Yellow/Brown leather; Unrestored original, 2 condition; Not sold at Hammer bid of $725,000. With Reserve. – Yellow calipers, Michelin Pilot Sport tires, wood shift knob, factory stereo. – From the Les Quam collection. Represented with 2,000 miles and looks new, just as most Carrera GTs do. – This car has barely any miles on it, but that’s the case with most Carrera GTs. The only thing particularly special about this one is that it’s not silver, but that doesn’t justify refusing the entirely appropriate reported high bid here. 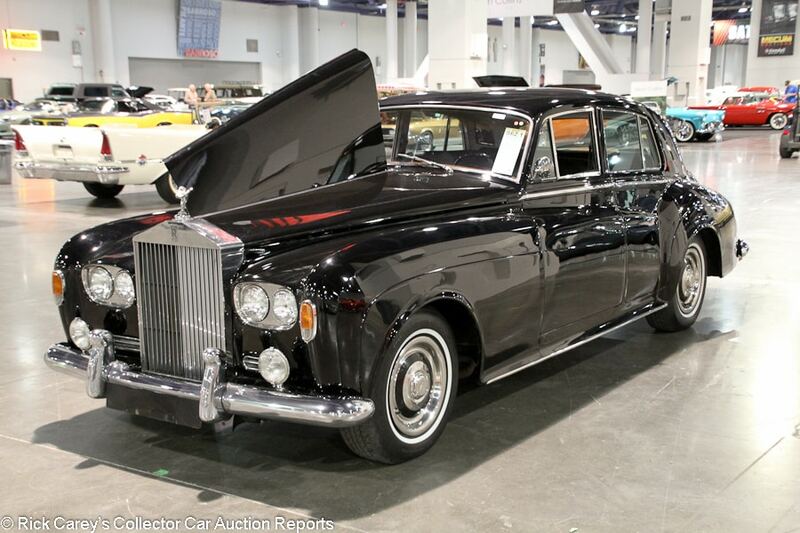 Lot # S62.1 1963 Rolls-Royce Silver Cloud III 4-Dr. Sedan; S/N LSCX215; Black/Black leather; Older restoration, 3 condition; Not sold at Hammer bid of $47,000. With Reserve. – Desirable LHD model with wheel covers, radial narrow whitewalls, Lucas driving lights, dual mirrors, modern stereo, modern alternator, ignition and A/C. – Tired old paint. Wavy body sides. Tidy and maintained but used engine bay. Lightly scratched brightwork. Light cracks in the taillight lenses. Some of the original tools are missing. Sound underbody with no visible rust. Very good redone leather and wood, – The final quad-headlight Cloud IIIs are worth the most. 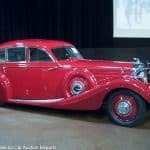 The reported high bid here was low even for a driver quality car, but it’s hard to bid with confidence on a classic Rolls when there’s little information or history to go on. Deferred maintenance on these cars can be debilitating both financially and for owners’ enthusiasm for them. 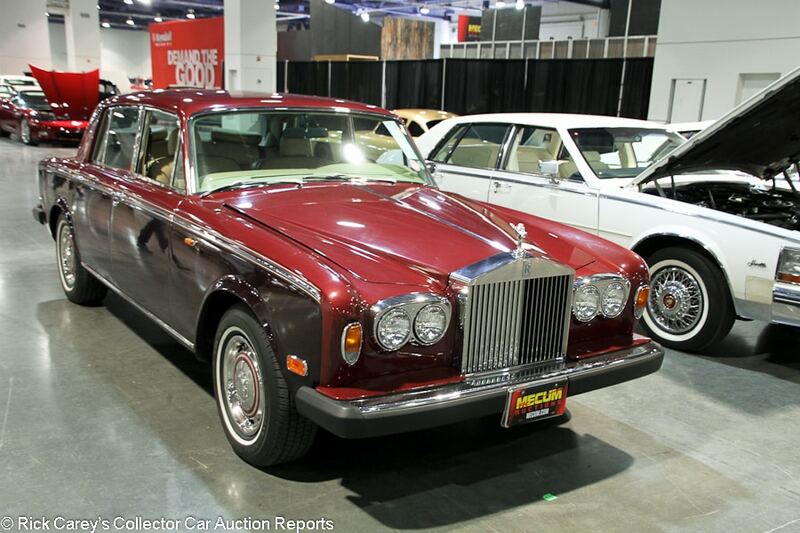 Lot # F210 1978 Rolls-Royce Silver Shadow II 4-Dr. Sedan; S/N SRG33955; Burgundy, Dark Burgundy/Beige leather piped in Burgundy; Unrestored original, 3 condition; Not sold at Hammer bid of $16,000. With Reserve. – Wheel covers, narrow whitewalls, power windows, air conditioning, Pioneer stereo, opera mirrors. – Showing 52,352 believable miles. Maintained but used engine bay. Faded paint that is crazed on top. Dull brightwork. The wood is very good, but the seats are lightly worn. A standard used old Rolls-Royce, the kind that can be temptingly cheap but must be approached with caution. – The reported high bid was plenty for a car in this condition, and it will only take another bill for transport to the next auction or another trip to the shop for the seller to regret passing on this offer. 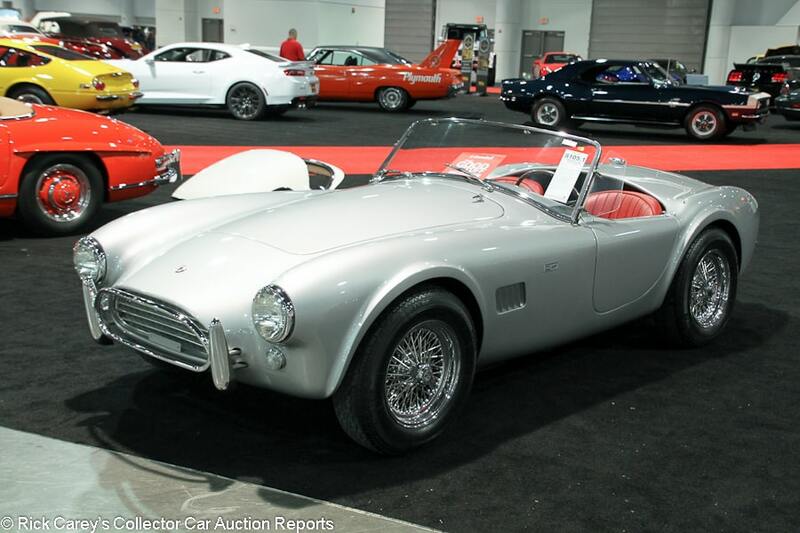 Lot # S105.1 1965 Shelby Cobra 289 Roadster; S/N CSX2549; Silver/Red leather; Older restoration, 2 condition; Not sold at Hammer bid of $925,000. With Reserve. – 289/271hp, C4 automatic, centerlock wire wheels, wind wings, AC woodrim steering wheel, Carroll Shelby signature on the glovebox. – Has a C4 automatic in it. Very clean engine bay. Very good paint and chrome. Uneven door gaps. Very good interior. Not a totally correct car, but fully restored and attractive. – Not sold at a $1M hammer bid at Mecum Indy in 2015, then hammered sold for $1,045,000 ($950,000 hammer) at Mecum Monterey last year. The automatic’s appeal is rare, with only something like 20 Cobras built with automatics, and back in 2015 I was told by someone who had driven it that it’s crisp and sharp-shifting, chirping the tires on every upshift. But automatic or self-shifted is an elusive preference and the appeal was elusive here in Vegas with the car coming up short. No harm, no foul. Try again. 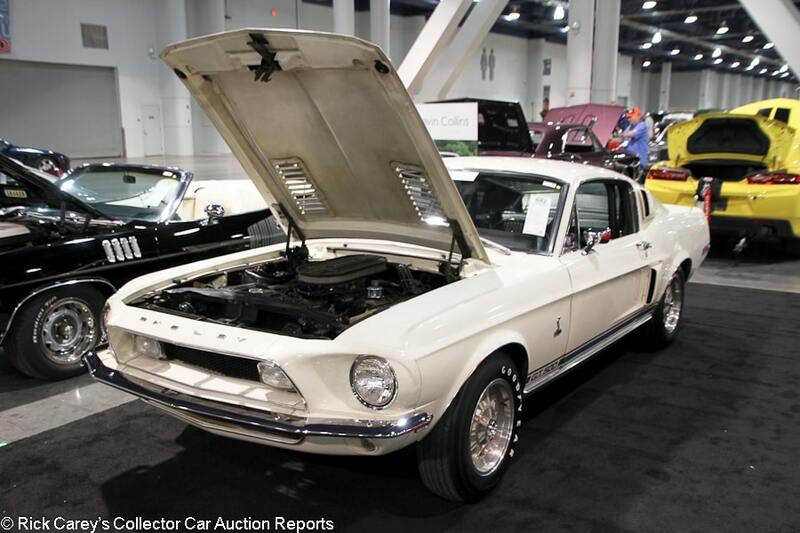 Lot # S82 1968 Shelby Mustang GT500 Fastback; S/N 8T02S143366-01367; Wimbledon White, Blue side stripe/Black vinyl; Unrestored original, 2 condition; Not sold at Hammer bid of $80,000. With Reserve. – 428/360hp, automatic, Shelby alloy wheels, Goodyear Speedway tires, console, Philco radio, woodgrain dash, power steering, power brakes. – From the Kevin Collins collection. One owner car that comes with window sticker, build sheet and original bill of sale. All original other than tires, battery and exhaust. There are a few scuffs and chips on the nose but the original paint and brightwork are very good. The engine bay is used but maintained. The interior is also lightly worn but very good for its age and miles. A fantastically preserved original GT500 that you could still actually go out and burn rubber with. – Not sold at a $120,000 high bid at Mecum Indy this year, then $110,000 at Harrisburg in August, both of them a lot closer to the true value of this time warp GT500 than the anemic bid here in Vegas. 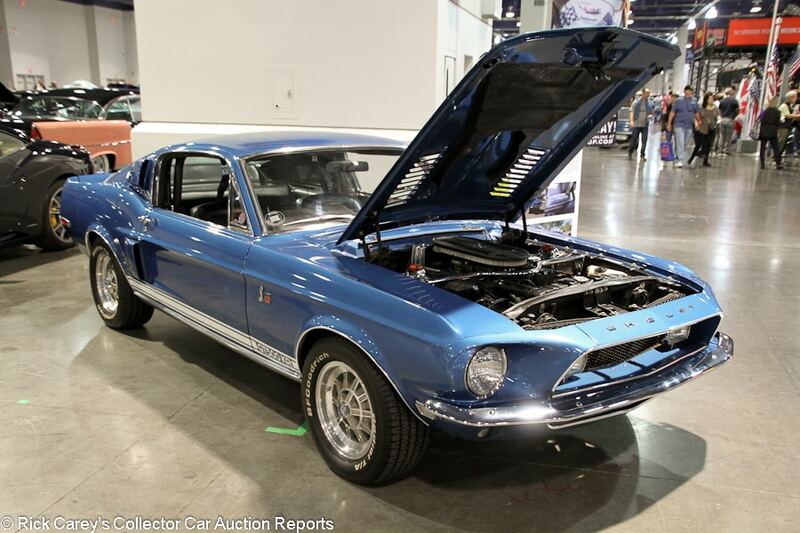 Lot # S229 1968 Shelby Mustang GT500KR Fastback; S/N 8T02R213228-03953; Blue, White side stripes/Black vinyl; Unrestored original, 2 condition; Not sold at Hammer bid of $85,000. With Reserve. – 428/335hp, 4-speed, Shelby wheels, Radial T/A tires, Hurst shifter, console, Philco radio. – A genuine, documented GT500 KR. The engine has been rebuilt (200 miles ago) but the rest of the car is unrestored. Tidy engine bay. The paint and chrome are very good and look only a couple of years old, not 50. There is some rub through on the trunk lid as well as some chips around the edges of it, though. The interior similarly shows barely any wear. It’s no wonder they didn’t restore the rest of the car. It’s way too well preserved. – Without taking originality into account this should have been a $125,000 GT500KR. It’s as if the bidders took a realistic premium for preservation and subtracted it from the bid instead of adding it. The result here makes no sense. 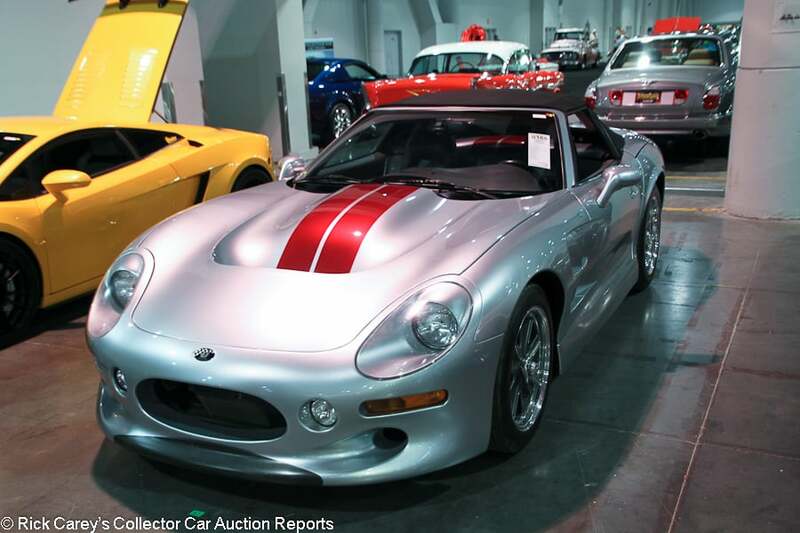 Lot # S165 1999 Shelby Series 1 Convertible; S/N 5CSXA1811XL000215; Silver, Red stripes/Black, Gray leather; Black cloth top; Unrestored original, 2 condition; Not sold at Hammer bid of $90,000. With Reserve. – 6-speed, Nitto tires, power windows, air conditioning, Monsoon CD/cassette stereo. – Undisclosed mileage. Very good paint. Negligible wear on the seats. Close enough to a new car. – The jury is still deliberating the fate of the Series 1, a car fraught by regulatory and production snags and bedeviled by abominable initial quality. Most of the latter can be resolved, but the reputation remains and this bid is a reasonable offer. 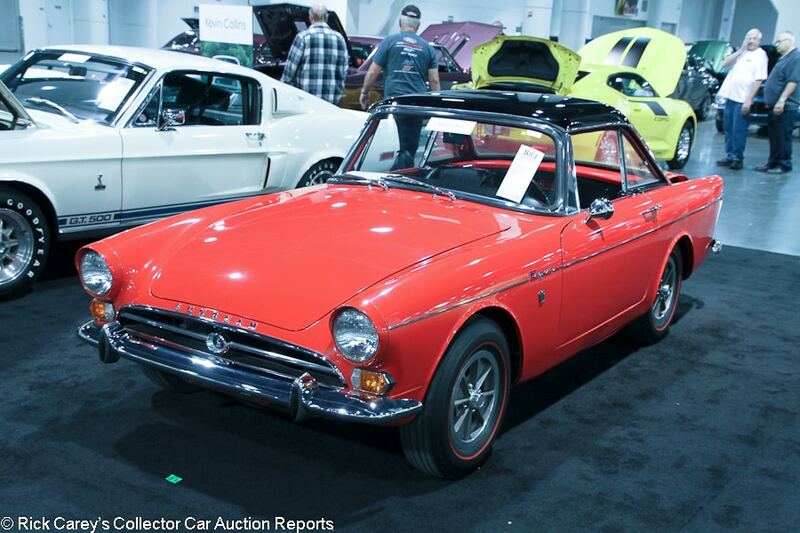 Lot # S83 1965 Sunbeam Tiger Mk I Convertible; S/N B9470832LRXFE; Carnival Red, Black hardtop/Black vinyl piped in Red; Visually maintained, largely original, 3+ condition; Hammered Sold at $72,500 plus commission of 10.00%; Final Price $79,750. With Reserve. – 260/164hp, 4-speed, cast alloy wheels, Uniroyal Tiger Paw tires, hardtop, woodrim steering wheel, wood dash, console. – From the Kevin Collins collection. Represented with four owners from new. Decent old paint with a few chips and scratches on the nose and hood. Good interior with some cracks in the dash. Dirty original wheels. Tidy but unrestored underneath. Some light cosmetics were done a while ago, leaving an attractive driver but nothing more. – Bid to $110,000 but not sold at Mecum Kissimmee in 2013, then again at Kissimmee in 2014 at a $95,000 high bid and again at an $80,000 high bid in Austin eleven months later. Finally let go here in Vegas, but it still sold at a reasonable price given its condition. 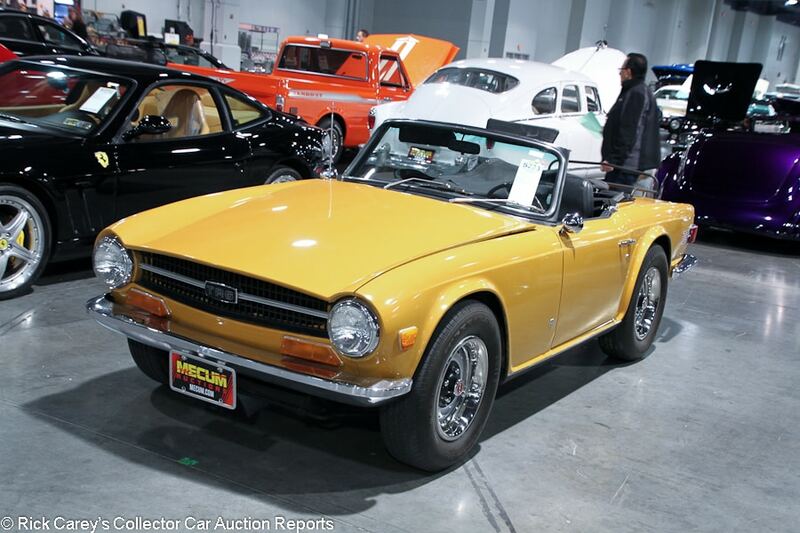 Lot # S233 1969 Triumph TR6 Convertible; S/N CC80649U; Saffron Yellow/Black vinyl; Black cloth top; Enthusiast restoration, 3- condition; Hammered Sold at $20,000 plus commission of 10.00%; Final Price $22,000. With Reserve. – Uniroyal Tiger Paw tires, woodrim steering wheel, Kenwood stereo, tonneau cover. – Represented as restored 10 years ago with rebuilt drivetrain. The paint looks good from a distance and doesn’t have any blemishes but up close it’s a bit faded. The engine bay is grimy and dirty. Not everything under there was restored or replaced. The chassis got undercoated a while ago but the underbody is pretty dirty and road worn. The luggage rack is incorrect and was crudely screwed into the trunk in only two spots. The cloth top is new and good, but the top frame is original and rough. There is a small rip in the driver’s seat but the interior is mostly good. This car looks great from a distance, but it’s pretty rough up close. – Reported bid to $14,000 at Mecum’s Monterey auction three months ago and an expensive result here, bordering on the excessive. This kind of money should buy a freshly restored and nearly like-new slim bumper TR6, but got a barely decent driver. The new owner will have a very tough time selling it on for anywhere close to this result in the near future and anything spent on addressing its many needs is money down the drain. 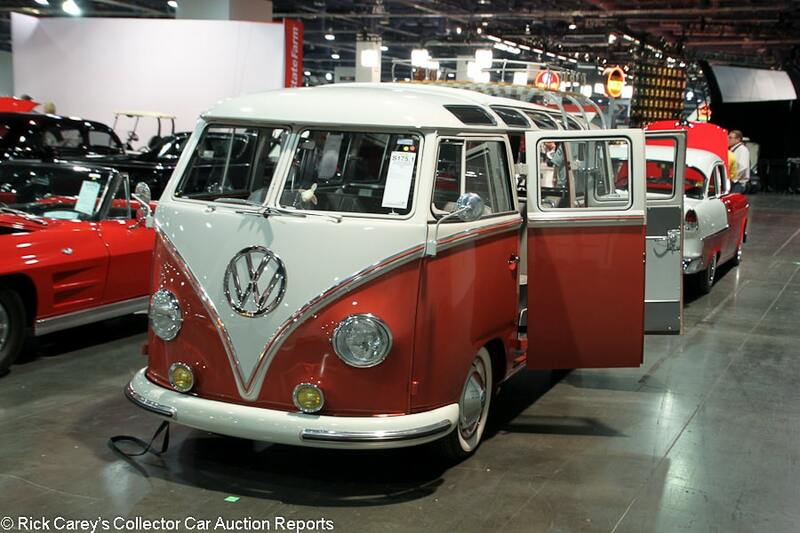 Lot # S175.1 1959 Volkswagen Type 2 Microbus, 23-Window; S/N 554117; Light Red, Cream/Gray vinyl; Recent restoration, 2+ condition; Not sold at Hammer bid of $100,000. With Reserve. – 23-window, hub caps and trim rings, whitewalls, roof rack, Blaupunkt radio, dash clock. – Delivered new to South Africa, so it is RHD. Excellent paint and brightwork. Spotless engine bay. There is some orange peel in the paint around the license plate. Excellent interior. Fully and recently restored, but not overdone. Not the world’s best, but still very good and very collectible. – Not sold at a $150,000 high bid at Mecum Monterey earlier this year, which really should have been taken. Six figures for a VW with 36hp, not to mention one with the steering wheel on the right, seems crazy on the surface of it, but that’s the state of the market for over-restored 23-window models. 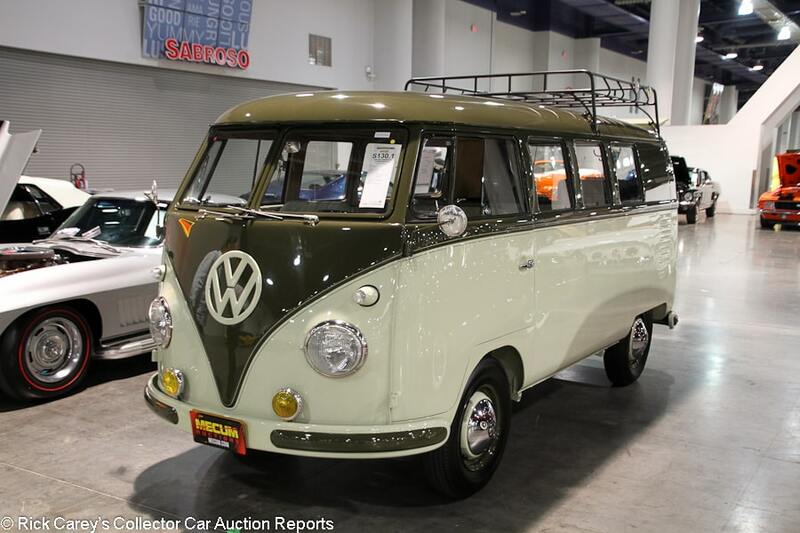 Lot # S130.1 1958 Volkswagen Type 2 Kombi Microbus; S/N 362976; Green, Light Green/Light Green piped in Dark Green; Concours restoration, 1- condition; Hammered Sold at $52,000 plus commission of 10.00%; Final Price $57,200. With Reserve. – 11-window Bus with roof rack, hub caps, Firestone blackwall tires, pop-out safari windows. – The VW badge on the nose doesn’t quite fit evenly. Otherwise, this is essentially a perfect over-restored 11-window from top to bottom. The colors are unusual but charming. 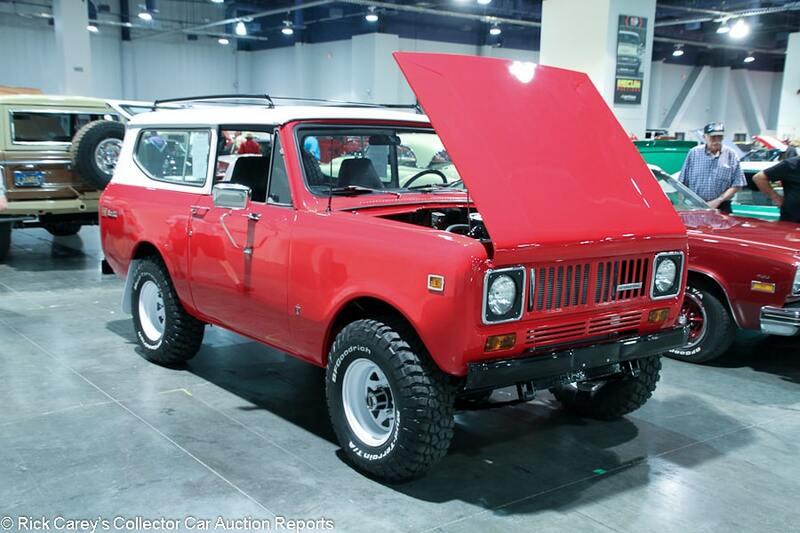 – After it failed to sell at an $85,000 high bid at Mecum Anaheim last year and again at a $77,0000 high bid at Mecum Monterey this year, the seller decided to let go at a modest but not unreasonable price in Vegas instead of hauling it from auction to auction looking for the highest price. The VW bidders were likely saving their attention for the 23-window that crossed the block later in the day. i find your blog with my split vin number . the split is actually in a container somewhere between los angeles and france …the corvette will be located in south of france in few weeks (my village is “saint tropez” ) . it s a funny destiny for this old vette .